Solar grid parity? | Climate Etc. There are many journal articles, media stories, NGO papers, and blogs claiming solar already has, or soon will, reach general grid parity. Grid parity is when the cost of solar equals the cost of conventional electricity alternatives. It should also mean equal without subsidies like feed in tariffs (FiT), net metering, and tax credits. This seemingly simple idea is not so simple. Grid parity depends on what sort of solar, on whose grid, and in what location. Solar needs insolation (sunlight energy), and that is quite variable with latitude and regional cloudiness. Red/orange is good, blue/violet is bad, yellowish is so-so, and greenish is worse than yellow but not as bad as blue. What might work well in Phoenix will not in Seattle. Or in Germany, which we will examine in more detail, since its grid is now 6.9% solar generation coming from the world’s greatest installed photovoltaic (PV) capacity (now 38.5 GW, 26% of world total PV). Grid parity is another wicked problem. As with the true cost of wind we are not assigning ‘carbon externality’ costs to conventional generation, which are debatable. There are two fundamental kinds of solar generation. Photovoltaic (PV) uses semiconducting solar cells to generate DC electricity, which is ‘inverted’ to grid compatible AC. Einstein explained the underlying theoretical photoelectric physics in 1905, which earned his 1921 Nobel Prize. The other kind is concentrated solar power (CSP), which is simply a magnifying glass concentrating sufficient sunlight energy to drive a thermal generator, usually an ordinary steam turbine. There are two sorts of ‘magnifying glasses’: parabolic troughs and heliostat ‘power towers’. CSP requires high insolation, which explains why ‘blue’ Germany’s solar is PV. Solar grid parity depends on whether one is comparing residential or utility scale solar and electricity pricing. Residential has the highest grid distribution costs, so the highest electricity price/kWh. 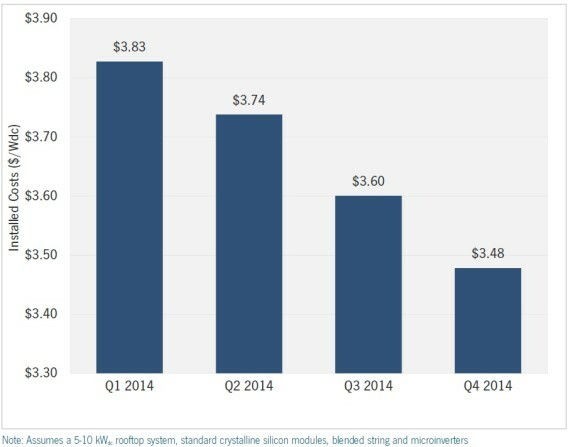 A U.S. rooftop PV system cost about $5.80/W in 2014; utility PV cost about $4.5/W (shown below). Solar parity also depends on the alternative generation mix in the grid comparison, which depends on the grid. We show below that both forms of solar may be at grid parity in northern Chile. Chile electricity generation costs from ~$0.16/kWh (off peak spot market) to ~$0.25/kWh (peak). Chile is split roughly equally into 1/3 inexpensive hydro (in the south), and 1/3 natural gas plus 1/3 coal in the north. Chile imports all of its natural gas (most as expensive LNG), and most of its coal. Northern Chile has inherently high cost generation. The 2014 Energy Information Agency (EIA) estimates 2019 utility scale solar levelized cost of electricity (LCOE) is nowhere near parity: $130/MWh for PV ($119 after subsidies), and $243/MWh ($224 after subsidies) for CSP. Those generation figures compare to ‘true’ (hidden carbon tax and lifetime adjusted) CCGT or USC coal at ~$57/MWh. The EIA analysis’ table 4 estimates the difference between levelized avoided cost of electricity (LACE, that is, the alternative cost of the actual generating mix in 22 separate US regions) and LCOE. If LACE-LCOE is positive, then solar generation costs less and should be built. EIA says utility PV will be past grid parity by 2019 in some regions (red/orange insolation), but not in most or on average–contrary to Scientific American. CSP will still not be viable in any US regions. The basic question we explore here is whether, when, and where solar might reasonably be expected to improve enough to reach general grid parity— depending on better efficiency and lower cost. Secondarily, why has so much solar already happened if parity has not yet been reached? And why do the media claim parity has been achieved? In 1961, Shockley and Queisser (S-Q) first calculated the theoretical quantum efficiency of a simple single junction solar cell. A simple PV cell can be at best ~31% photoelectric efficient converting sunlight energy into electricity. Theoretical S-Q PV efficiency cannot be achieved in reality. There are a number of hurdles including reflectance, charge carrier recombination, grain boundary charge trapping (in polysilicon), and conductor resistance. These vary by semiconductor material and cell design. 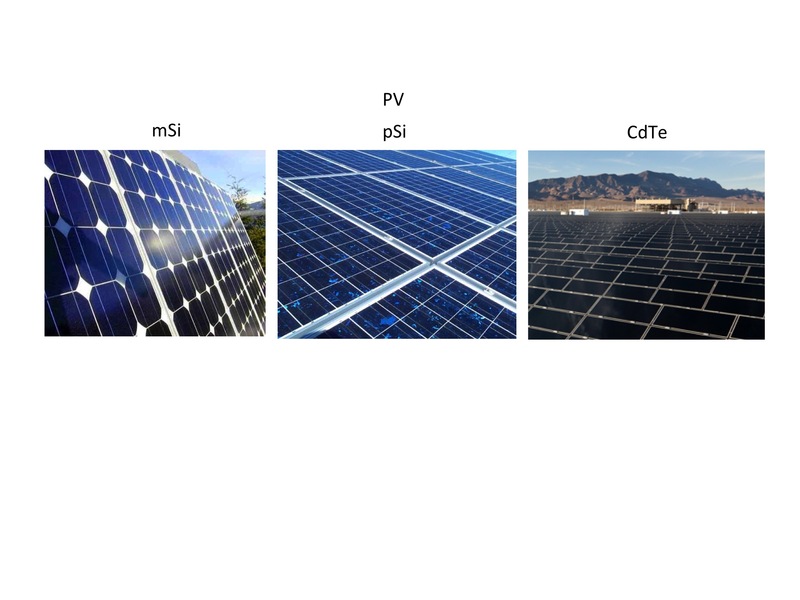 For example, the highest efficiency monocrystalline silicon cells add special coatings to reduce reflectance, and use copper rather than aluminum to reduce resistance. They are ‘thick’ to maximize light capture efficiency, but that thickness increases charge carrier recombination and lowers photoelectric efficiency. Solar cells have been researched for four decades. The three commercial types are maturing in efficiency and in manufacturing cost. There has been no meaningful increase in research cell silicon efficiency since about 2000 (monocrystalline silicon (mSi) 25%, polycrystalline silicon (pSi) 20.4%). 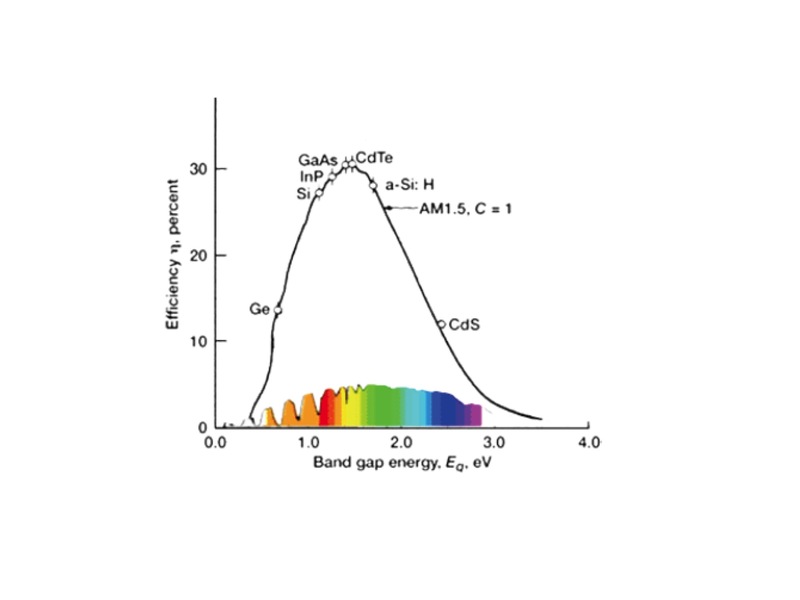 There has been some recent progress in thin film cadmium telluride (CdTe, First Solar 21%). Research cells deceive concerning grid parity. The highest production efficiency mSi panels (uniform dark blue with little aluminum ‘diamonds’ from missing round boule corners) are 21.5% (SunPower). pSi panels (mottled light blue, no ‘diamonds’) from China—which drove the rapid drop in panel prices from about 2010 to about 2013 when China’s SunTech went bust—are now 15.6% (Yingli). First Solar CdTe (black) production panels have reached 14.7%. On the other hand, high purity high efficiency mSi is expensive. SunPower’s best E20 panels cost about $1.70/W and sell now for about $2.15/W. Thin film CdTe is inexpensive; First Solar says panel manufacturing cost is now $0.54/W. Their panel ‘price’ is under $1/W (uncertain since FSLR sells utility systems, not panels). So PV has high efficiency high cost panels, or low efficiency low cost panels. PV does not have high efficiency low cost panels. FSLR says it can achieve 17.5% CdTe production efficiency by 2017, and EIA says that would enable true utility PV LCOE parity in a few US regions. As with most ‘factory made’ goods, PV costs follow an experience (aka learning) curve. This is a log/log linear relationship. The PV curve is about 20% cost reduction per doubling of cumulative production. But with so much PV already produced, each additional cumulative doubling takes much longer in calendar time. First Solar says it has now installed 10GW over its entire history. So the next ~20% cost reduction (from ~$0.54/W to ~$0.43) requires production of another 10 GW. Rapid cost reduction lies in the past, not in the PV future. The reason that PV panel efficiency/cost is such a big deal (now mature and slow to improve on both dimensions) is that panels have become the lesser cost of any PV installation. The remainder is ‘balance of system’ (BOS). BOS includes mounting brackets (and for utility installations, sometimes one or two axis sun tracking mechanisms), wiring, inverters, installation, and maintenance (cleaning dirty panels no different than cleaning dirty windows). At least 80% of BOS costs are directly related to efficiency. For any given amount of generation, a 21.5% efficient panel compared to 14.7% requires (14.7/21.5) ~2/3 the land or rooftop, mounting bracketry, wiring, installation labor, maintenance. Nobody knows how to significantly reduce BOS other than by higher efficiency (now with no to slow gains). 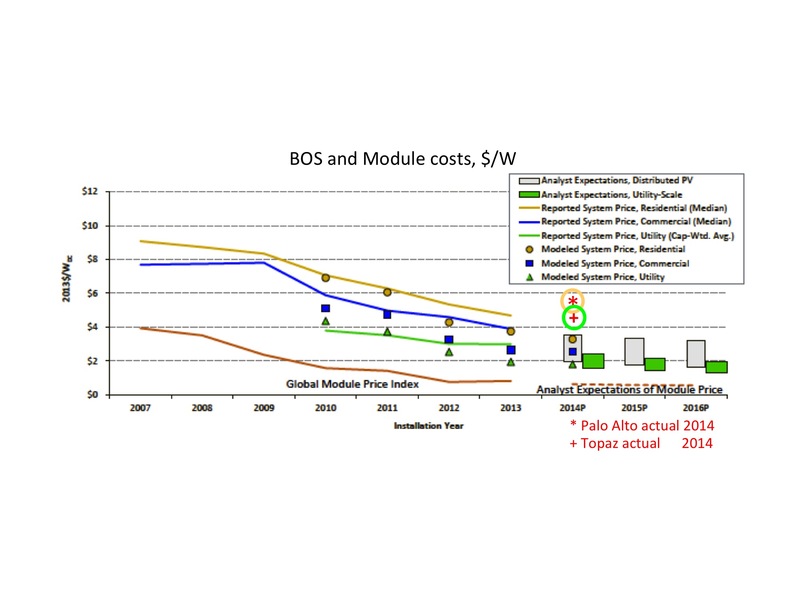 Most BOS costs do not scale, and only inverters follow a learning curve. Grid parity is no longer about PV panels, but rather about BOS. Note that the following 2014 NREL figure is on a WDC basis. The city of Palo Alto says a 5kWDC rooftop installation only produces about 4kWAC (owing to inverter losses, suboptimal roof angle/orientation, …). Note further that NREL BOS ‘reality’ was more expensive than NREL projections for 2012 and 2013. Note that ‘Analyst Expectations’ are those of the PV industry. Finally, note that the actual 2014 residential PV cost in Palo Alto was $5.83/W, not NREL’s ~$3.50/W. California’s 550MW Topaz PV project completed in 2014 cost $1.8 billion or $4.54/W (with capacity factor 23%). California’s 550MW Desert Sunlight PV was completed January 2015 at $4.18/W because it sits on federal land in the Mohave Desert. Those new California utility PVs are presently the largest in the world. BOS and efficiency are so important that First Solar (CdTe) opened a line in Malaysia in 2014 to manufacture 100MW/year of high efficiency mSi panels in order to compete beyond the utility marketplace. Given all this information, we return to our initial background question. How did low insolation ‘blue’ Germany become the world leader in installed PV capacity? In short, Germany passed the 2000 Erneuerbare Energien Gesetz (EEG, Renewable Energy Law). 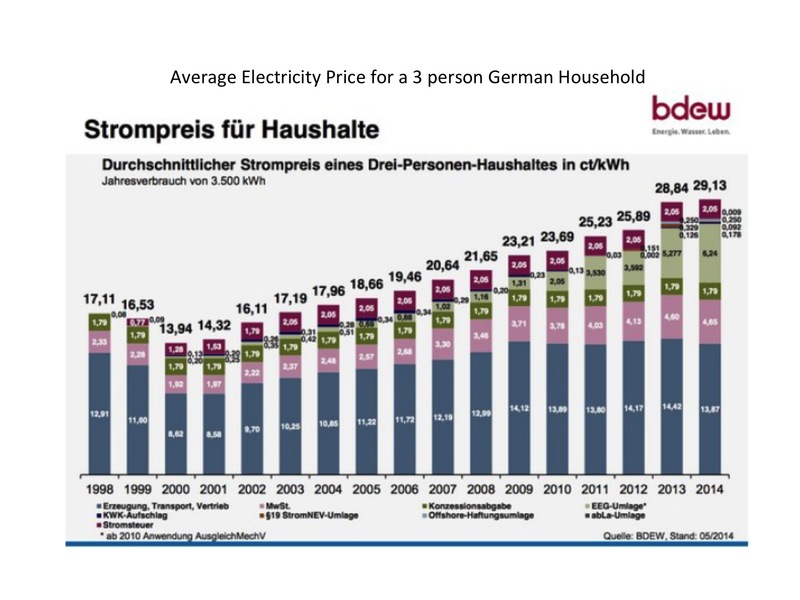 Since that time, Germany’s residential electricity price has more than doubled, and Germany now has the second highest rate in Europe after Denmark. Denmark also has a higher renewables penetration (39% wind in 2014) than Germany (19% wind and 7% PV). The EEG Umlage (surcharge for PV FiT) has grown from nothing to €0.0624/kWh, 22% of what a German household paid in 2014. That Umlage provides about €11billion (2014 estimate) of FiT subsidy to PV owners. Germany’s residential electricity cost is now about €0.29/kWh. When the EEG law passed in 2000, it was €0.14/kWh. 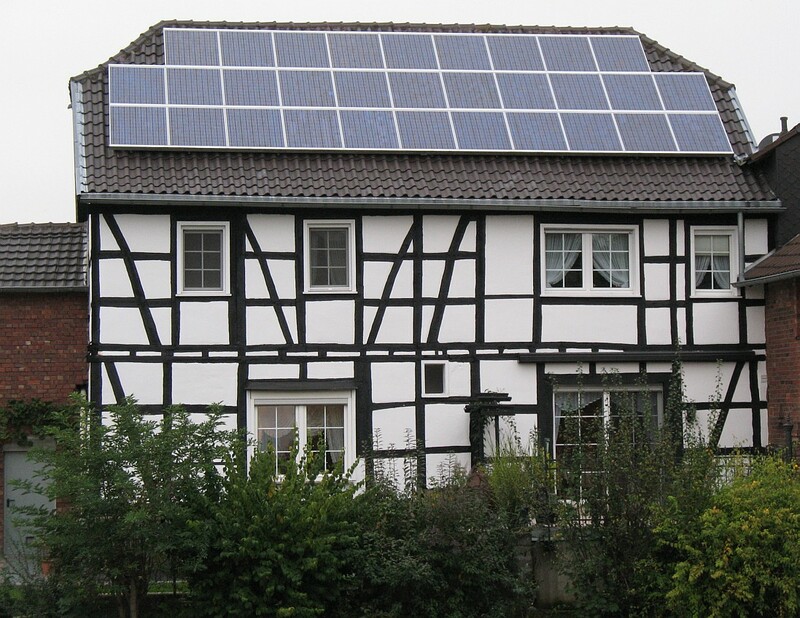 Fraunhofer ISE claims residential PV reached German grid parity in 2012. But that is only thanks to Energiewende elevated electricity pricing. It is not close to ‘true’ parity, and probably never could be due to ‘blue’ Germany’s low insolation. The same thing has happened in the US, where residential solar is said to be at grid parity in California. California’s average delivered residential electricity price (EIA March 2015) was $0.17/kWh. So EIA’s $0.13/kWh utility PV estimate ‘works’. Except that compares residential apples to utility oranges. So does Palo Alto’s rooftop PV LCOE estimate of $0.155/kWh before subsidies, linked above. But neighboring Arizona’s March 2015 residential rate was $0.115/kWh. In 2005, the year before California passed its 2020 renewables mandate, its average residential rate was $0.116/kWh—like Arizona today. PV is at California parity only because of electricity pricing distortions from its renewables mandate– an economically irrational self-fulfilling prophesy. Thanks to Chile’s inherently high cost generation, Spain’s Abengoa just won an open bid auction to supply 950GWh of solar to Chile’s central grid over 15 years. Atacama Desert (highest insolation in the world) generation will come from two 110MW power tower systems and one 100MW PV. Since the auction was open to CCST and coal bidders, this might seem market evidence of unsubsidized CSP grid parity under those circumstances. Not according to Abengoa Solar’s own announcement about the award. Abengoa receives direct subsidies from Chile and the EU; Chile set a goal for 20% renewables by 2025. The facilities are partly funded by the Clean Technology Fund, a World Bank administered $5.3 billion clean tech aid program. Even in high cost high insolation northern Chile, CSP is apparently not at grid parity without subsidies. Abengoa’s Solana parabolic trough CSP figured above is 70 miles southwest of Phoenix Arizona, where the residential rate is $0.115/kWh. It cost $2 billion for 250MW (net), of which $1.45 billion was covered by a federal loan guarantee. Plus Abengoa received ~$600 million in federal cash payments under the 2009 American Recovery and Renewal Act (ARRA2009) in lieu of the 30% Investment Tax Credit (ITC) on renewables, itself an optional alternative to the Production Tax Credit usual for wind. So Abengoa effectively has nothing invested. It has a contract to sell Solana’s utility generation to Arizona Public Service (APS) for 30 years at $0.14/kWh, which is 21% over the residential rate, and more than twice what equivalent dispatchable CCGT would have cost. APS made this unfavorable power purchase agreement (PPA) because Arizona mandated 15% of its power be renewable by 2025. Brightsource’s Ivanpah power tower CSP figured above sits in the Mohave Desert on 3500 acres of federal land. It cost $2.2 billion for 377MW (net). It received a $1.6 billion federal loan guarantee, plus ~$660 million in federal cash payments in lieu of ITC under ARRA2009. It is also ‘free’ for its backers. But not free for California ratepayers of SoCalEd and PGE, who are purchasing its utility generation under a 25 year PPA at $0.185/kWh after time-of-day adjustments. That is 8% above California’s residential rate, 59% above what the California rate was before its 2006 renewables mandate, and 3x CCGT generation rates. Ivanpah ironically helps guarantee California residential PV ‘grid parity’, but only in a very costly artificial sense. 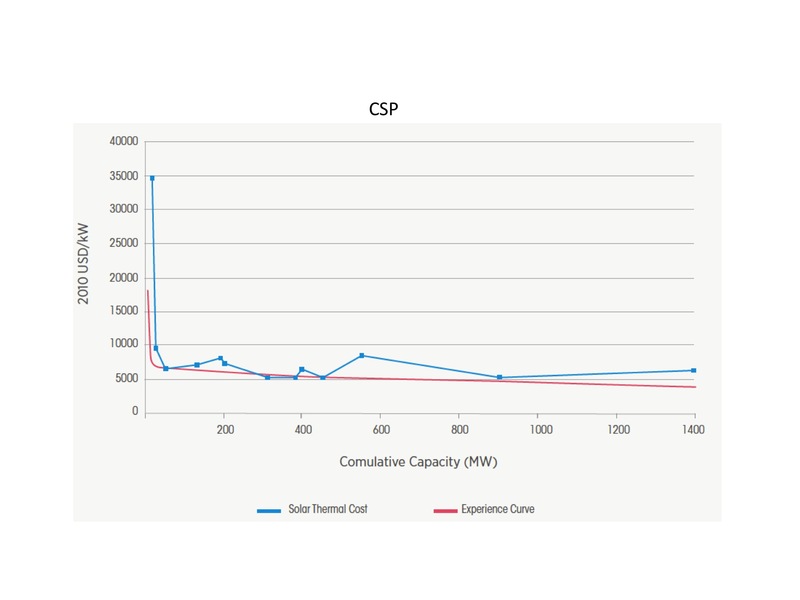 The fairly unique characteristics of each CSP installation make experience curve cost reductions unimportant. Since steam turbine efficiency is already mature, it is probably not possible for CSP to ever reach true grid parity even in high insolation areas. Abengoa and Brightsource might disagree; but then why are they lobbying to make the 30% ITC subsidy permanent? Solar is variable (day/night) and intermittent (clouds). How this affects grid backup cost depends on the grid location. Those ‘hidden’ costs are lower where peak is summer midday driven by air conditioning, such as southern California. The hidden PV backup costs are much higher if peak is winter evenings, such as the UK and Germany. The benefits of residential solar are also inflated by a hidden ‘net metering’ subsidy. Net metered residences receive a credit for each kWh injected into the grid equaling the billed price of each kWh drawn from the grid. 44 US states including California have net metering. In California, utilities pay the customer ~$0.17/kWh for residential PV flowing onto the grid. The utilities could have purchased that electricity from conventional generators for about $0.06/kWh. The ~$0.11/kWh difference is a wealth transfer from non-solar to solar customers. Net metering means PV owners pay less, so non-PV customers have to pay more to cover total utility costs. California’s Public Utilities Commission (CPUC) estimates this will be $1.1 billion by 2020. Such subsidies cannot be sustained as the proportion of residential PV on the system increases. The subsidies grow exponentially with increased participation as the subsidizing group gets smaller and the subsidized group gets larger. For example, if the annual subsidy cost non-PV customers only $1 at a 0.1% penetration level, it will grow to $10 at 1% penetration, $53 at 5% penetration, and $250 at 20% penetration. Germany’s Umlage illustrates this. A practical solution to net metering’s hidden subsidy is suggested by Ontario. Because of the large number of summer vacation cottages little used in winter, Ontario electricity bills are split into a monthly delivery charge (just for being on grid, largely independent of kWh) and an electricity charge for kWh that pays for generation. But implementing that practice would reduce or eliminate ‘apparent’ residential PV parity. PV is probably already at ‘true’ grid parity anywhere high insolation and inherently high cost conventional electricity generation coincide. This is, for example, the case in Hawaii where the average electricity price is presently $0.385/kWh, insolation is ‘yellowish’, and a number of utility PV installations have been built. It is credible that in reasonably insolated areas, PV will approach grid parity in the next few years even considering intermittency costs. The Southwestern US, Spain, southern Italy, northern Africa and its southern desert tip, India, and parts of Australia are plausible regions for eventual ‘true’ PV grid parity given their summer peak loads. The Saudi Arabian peninsula would be a candidate but for its abundant inexpensive natural gas and CCGT. Renewables advocates can now show PV at ‘artificial’ grid parity where subsidies and/or renewable mandates have distorted electricity pricing, which is the case in Germany and California. PV parity becomes a lot easier if the price of electricity is increased 50 to 100 percent by fiat. In the U.S., existing CSP projects would not have been built but for federal loan guarantees, the provisions of ARRA2009, and state mandates. All proposed but unbuilt U.S. CSP projects have been postponed due to expiration of most ARRA2009 provisions and uncertainty about the ITC set for reduction to 10% in 2016. These actions by CSP developers prove there is no US parity. So long as the US has abundant inexpensive natural gas for CCGT, there will never be. Like wind, solar is ‘horses for courses’. Where conditions are favorable (California’s Mohave, Chile’s Atacama), some solar will sometimes make sense. Because of intermittency and ‘hidden’ grid backup costs, a lot of solar may not make sense even with summer peak air conditioning loads, as California is apparently in the process of learning. The pell-mell PV rush in the UK and Germany (where peak loads are winter evenings) only makes sense if CAGW is believed so dire a problem that high mitigation costs are of no consequence. We doubt that is the case, and suspect the UK and Germany will eventually discover reality the hard way as their conventional generators are driven out of business by renewables forced flexing. Forbes 11/10/2014 and 1/19/2015, FSLR 1Q2015 earnings call. Anecdotal I realize, but I paid $3/kwh before subsidies in late 2014 in Nevada (5kw system, $15k…$9.5k after Federal and NV Energy credit). I calculated that it would pay for itself after 5 years (including subsidies) — that doesn’t count the value that it adds to the home. Complete no brainer for me personally. What is a bit irksome is that I’m still grid-connected for obvious reasons, and still have to pay a monthly maintenance charge of $10. Looking forward to battery technology maturing and becoming less expensive to ‘cut the power line cord’ permanently. We hopefully have a JC guest post coming on grid storage and your ability to ‘cut the cord’. Probably not. Phoenix and Seattle are on the same grid. Roger Andrews over at Energy Matters has a couple of very interesting posts regarding the cost of stored energy. The series of posts was triggered by the introduction of the Tesla batteries. Production should not be the point. The peasants weren’t producing much value. When something is purchased it should have value, to the purchaser. Buying something that has value because it takes value from others without compensating them is arguably the opposite of value. The same as the Chinese pig iron passed on value by doing the wrong thing. They could point to the iron, yet it was valued less than the resources that went into it. With no net metering, private solar could attempt to minimize its reliance on the grid. With net metering, private solar could orientate their solar as the utility wants it to to help as best it can with load peaking, or other requirements of the grid. Private solar can try to grab every dollar it can get its hands on, or try to live in harmony with others. Presumably if you were going to rely entirely on your own power generation you would need to take out a maintenance contract to ensure it works 24/7? Presumably you would also need to add in the costs of replacement parts which will wear out quicker if you are using your own equipment all the time? Add in the capital costs of battery technology and associated storage costs and the equation may look different. PV efficiently fades over time (decades) but does not wear out as a function of how much you use it. Electronics don’t usually “wear out” , though I’m sure we’ll soon have “smart” microprocessor inverters that decide they have a mysterious “fault-C495” after a certain number of hours of service. The main thing that does have a usage related life-time is battery storage. I have a few friends that run off-grid in isolated sites. They estimate that buying new lead-acid accumulators is comparable to the cost of the grid connection subscription ( in France ). Storage is one key area cost and longevity can make an important difference. A lead-acid accumulator, like those mounted on vehicles, allow only a very small number of “deep discharges”, meaning that if one wants to go off-line and live with only what his/her PV system delivers then he/she will have to replace said batteries every couple of years at best. In order to store a sufficient amount of electricity during summer days and then use them during winter days (even without considering losses) one would need TENS of such “car sized” batteries. I happen to live in France, and my yearly subscription to the grid connection is, for a 9 kVA meter, 86.5 Euros (which is LESS than the cost of ONE small 75 A*hour car battery (between 100 and 130 Euros in France)… so whoever told you this has not been very accurate to say the least… I would dare to say he/she missed the point almost completely. Not tens but thousands of car size batteries. One car battery can store less than one kWh, and typical winter time consumption is a couple of thousands of kWh (varying of course greatly). Anecdotal I realize, but I paid $3/kwh before subsidies in late 2014 in Nevada (5kw system, $15k…$9.5k after Federal and NV Energy credit). Just out of curiosity, Nevada should produce 25 kwh to 30 kwh from a 5 kwh system depending on how far south the location is..
How many kwh does your system produce on average? Was just reminded today of the progress of Perovskite technology courtesy of NextBigFuture (http://nextbigfuture.com/2015/05/near-term-transparent-solar-power.html). Separately I’ve also been tracking hybrid pv thermal (use the light waves the PV can’t use for heat). HAS, We have another possible post coming on grid storage. Hybrid perovskite solar was ruled out by JC as too complicated and speculative; we had paragraphs on it in the initial draft. Dig into new hybrid perovskites, and realise there are severe unsolved humidity sensitivity and light exposure degradation problems. With NO known solutions. Even the linked NREL chart ‘asrerisks’ it as ‘unstabalized’. JC asked us to take such microminutia details out of this general guest post in order to focus on what might be possible given known solutions. We originallymhad two,paragraphs on it in. But do NOT think we were unaware or could not provide much more specific details. Separately, even in the first draft we chose not to discuss concentrated solar PV even though it is plotted on the NREL efficiency map. Hopelessly uneconomic. We are amazed you mention it here in this context. It’s a bit difficult to judge just how far Oxford PV (and Oxford and others) have got with techniques to overcome these weaknesses (eg with alternate hole transport material – see “Carbon Nanotube/Polymer Composites as a Highly Stable Hole Collection Layer in Perovskite Solar Cells” Habisreutinger et al. ), but meant more as an aside than a critique. On hybrid pv thermal I wasn’t talking about concentrating intrinsically. That is a different issue. There are two benefits if the wave lengths unusable by the pv are filtered prior to the pv (of whatever breed) and exploited thermally. Temp stabilization of the PV and potentially greater energy capture. Making it fly depends on appropriate materials for filters and thermal management and making the BOP manufacturable, but we aren’t having to functionalise materials to achieve the last two. I hope my skepticism of solar grid parity is unjustified, but official responses to questions about AGW after the Climategate emails surfaced in November 2009 have destroyed my faith government-sponsored science. Do you oppose all net metering? In its simplest form when the meter spins based on the direction of power flow with no time limits all at a constant price you will have they have the highest potential of maximal subsidies for the self generator. That might be acceptable in some cases (reverse flows are small compared to high overall usage, likely timing of reverse flow is beneficial, low levels of penetration, more complicated monitoring is costly, improve learning curve). Subsidies occur all the time in general can be acceptable, but at high levels they can have very serious market distortions. I would say many have the idea that net metering is always good, I would caution that it often/usually is not, but am open to the case for it in specific circumstances. PE – first, thank you, and Rud, again for another informative post. Re: net metering, I have a hard time understanding how it could ever be net beneficial. The benefit to the PV homeowner is obvious, but the disadvantages to all others seems to heavily outweigh the PV owner benefits, that is, increased costs associated with grid management as PV penetration increases, additional costs to non-PV users to subsidize a higher cost “source” of energy, and higher grid maintenance costs. What am I missing or not understanding? aplanningengineer:That might be acceptable in some cases (reverse flows are small compared to high overall usage, likely timing of reverse flow is beneficial, low levels of penetration, more complicated monitoring is costly, improve learning curve). I meant to ask whether you oppose all net metering and feed-in tariffs. Where I live (San Diego County), I am billed separately for the electricity I use (at $0.17/kwh) and my connection. If I installed PV panels, my surplus electricity would flow into my neighbors’ homes, and SDG&E would collect for those kwhs that they did not supply, as well as collecting for the grid connections. It would seem to me to be a step toward fairness for SDG&E to pay me somewhere between $0.06 and $0.12 that is transferred from my house to my neighbors’ houses. a planning engineer, thank you for that answer. I actually phrased my question incorrectly. Barnes-I think if you had solar with a high coincidence and expected availability with the system peak in a summer peaking entity the combined generation, transmission and distribution benefits, particularly if it delayed new construction could benefit all and may not end up being a subsidy at all. In other cases it might involve small subsidies. I don’t want to take a political stand on whether subsidies are right or wrong, but I will comment if they have the risk or probability of becoming so high and causing significant distortion such that they are not sustainable and cause harm. PE – thank you for your response. As usual, fair and informative. – reliable supply of power according to needs. – is very often underpriced by a big factor. This is an extremely important point that most of us take for granted. Consider the recent heat wave deaths in India. Although they were blamed on the heat (and that blamed on global warming) they were actually due primarily to lack of access to dependable, affordable electricity. The problem in India is, the average per capita income won’t cover the cost of an air conditioner compressor, much less an insulated house to put it in. Two years ago I experienced a electrical ‘disruption’ that cost me a $75 PC power supply and a $130 graphics card. I contacted the grid operator about my damages and was reminded that they can not be held responsible for damage to customer’s equipment due to grid fluctuations. So I bought a couple of UPS units and guess what I found out? Turns out I am experiencing at least 2 electrical ‘events’ per month. So in my experience my grid is very reliable if it’s not really wet, windy, hot or cold. If you produce more than you consume and sell the excess back to the utility company, they should be obligated to buy it back at a negotiated price, less than retail. Utilities buy and sell power between them, all the time. Say my utility Ameren UE posts the average of all contracts they have in effect during the year, and pays the residential power producer that average for excess power, while state and federal governments offer tax incentives for installation. If you are still a net consumer of power, net metering should work, though you should probably pay for the meter and a nominal connection fee. Except that for home solar installations, net metering means that they are being paid a retail rate for energy being put back onto the grid without having to pay for the meter or any additional connection fee. If I understand, or interpret, this post correctly, it appears that Californians get a premium for their net metering when compared to the cost of conventional power generation. Operative word in your comment – “should”. Utilities buy and sell all the time, *but at spot wholesale prices*. Feed-in tariffs at residential prices, much less higher than residential prices (i.e. FIT subsidies) is outright economic suicide. Utilities also have the ability to provide power at planned intervals. One utility doesn’t just hit up another and say: I need 100MWh in 20 minutes. I’m all for net metering if the solar PV homeowners are paid according to wholesale spot prices – including negative pricing as was experienced over 55 hours in Germany last year. Here downunder, some electricity suppliers would rather pay the punitive tax for not getting renewables than spend the money to “get” renewables that are not dispatchable and don’t always supply the rated amount anyway (so they have to pay the tax on a portion in any case). Disillusioned Spanish official expert disses solar power at length. Very good. Let’s party like it’s 1978 in Phnom Penh! Even the realists of Big Green remain hopeless cases. Lol … plus some gold doubloons! Very interesting. I’ve seen analysis of wind turbine technology that make a case stating that wind turbines actually use more energy than they produce, but this is the first artcle I’ve read that makes that claim re: solar. I would be very interested to hear what PE and Rud have to say on these claims. A 2013 Stanford University report, for example, calculated that global photovoltaic industry now requires more electricity to make silicon wafers and solar troughs than it actually produces in return. That sound likely true at this time. We can have a good idea of what something costs us. It becomes more complicated to take out the subsidies and more complicated to figure in the externalities. Among those, how much energy does it take to produce solar power? Optimistic estimates and projections say one to four years. (Note if you want to go down that road, there are more worms in the can-often dirty coal energy is producing in China to offset cleaner US usages.) But you also have the installation, shipping and other costs as well as that the units might not receive optimal sun, so as with all externality studies you can come up with a wide range of estimates depending on your biases. The expectation is that we will benefit over the life of these facilities as the rate that we build them slows down so the benefit of what is installed will exceed the usage of what is being manufactured. That may have problems if those assuming that renewable technology will continue to get better and better are correct. If that’s the case we are working to put maximal amounts of inferior technology in the most desirable locations for renewables. This means that better technology will not have an opportunity to be as fully employed or that we will not get the assumed life out of today’s technology. PE – again, thanks. I really appreciate your taking the time to answer my questions. As I have said before, I am a big fan of fossil fuels because of what to me are many obvious benefits that greens blindly ignore while grossly exaggerating the negative externalities. That being said, I also understand that they are a finite resource – how finite is difficult to assess, but I will take Rud’s analysis as a reliable estimate which, if I recall correctly, means we have another 50-60 years of supply left, which means we need to find viable replacements in the next 30-40 years, or something like that. Given that wind and solar are heavily reliant on fossil fuels for mining, manufacturing, transportation, land preparation, assembly and maintenance, my opinion is that we are wasting intellectual, financial, and natural resources pursuing these as viable alternatives/replacements. Add to that the land mass required for industrial scale (an oxymoron IMO) solar and wind installations alone makes them non-viable. I clearly do not know what the answer will be, but do not believe it will in the end include wind and solar. Nuclear seems to offer the most viable alternative at this point and with the right infrastructure, may be able to power the machinery needed to mine, transport, manufacture, etc. other nuclear power stations, along with the providing the energy needed for most if not all other manufacturing and farming processes – maybe grossly naive on my part, but that is the objective we need to set if we are going to get to a world that can survive without fossil fuels. I do not see wind and solar being remotely capable of providing the needed energy to power everything we now require, much less, what will be required in the future. “Globalclimatewarmingchange” is a massive and wasteful distraction. Barnes-I wouldn’t challenge anything you’ve said. I think sometime between the next 30 to 90 years we will “need” to stop using fossil fuel for energy and will also accomplish it with whatever the next best thing is. I don’t think India and Africa can wait for the next best thing. It seems unconscionable for people who have seen the benefits of low cost energy to deny the third world similar opportunities. To me lot of effort that are being made now to speed up the transition, don’t appear very likely to me to help in the final run. And they aren’t doing much in the short run either. I think using technologies where they work (not where you hope for them to work) and focusing on improving all technologies (while researching new technologies) and sharing those improvements with the third world is the way to go. Well said PE, I could not agree more. Now if we could just get our political leaders to embrace that approach, we may actually find viable solutions while at the same time help lift developing countries out of poverty. Interesting, related (to the first link) and updated discussion here:. Yet more evidence of how the nature of the “discussion” about climate change reveals patterns of interaction that run parallel to discussions of many other polarized issues. Yes, good luck with trying to heat your house using stored power during a UK winter. Heating likely needed during the day (space and hot water) and then increased as the sun sets from 5pm and needed until at least 9am the following day. Light levels generally are pretty low from End October to Mid March. It would be interesting to know how much storage would be required to power a house for 15 cold dark hours and how much it would cost and what space it would take up. Travelling through Germany Austria and Switzerland during the winter, it is striking how many solar powered houses are in deep shade from mountains or adjacent buildings during the winter day time. We need Renewable horses for courses. Solar might be fine in Southern California but it is not presently a cost effective or practical alternative in Northern Europe. Residential geothermal heat pumps can be effective in these situations and typically produce greater energy “savings” than PV by offsetting the heaviest load demands (heating & cooling). it comes down to it and the sun don’t shine. a pox on both their houses, upper and lower! Yes, some are more equal than others. A good and clear presentation. I can’t find much to disagree with in it. Early in the presentation you referred to the criterion based on the difference LACE-LCOE. It would have been nice to see that criterion applied more in practice but it’s, unfortunately, possible that it’s difficult to find situations where that can be done without recourse to additional questionable assumptions. The result is typically different in the short run and in the long run. The result depends also on choices made elsewhere in the system as you imply by your discussion of the influence of CSP installations to the California generation costs. But can solar panels stop the climate from changing? Seriously. You couldn’t make this sort of stuff up! Using the ‘97% logic’ required, obviously they have over regulated and over-installed. Thank you for a thoughtful summary. I do like the no noise, no fumes, and excellent reliability of the solar array at my summer house. Alas, my utility pays me avoided cost, 3 cents/kWh (presumably the coal cost), so I do not get my money back until after 2100. Thanks for preparing this post. The cost of subsidies is a negative externality, a cost not directly paid by the customer. So are loan guarantees and the cost of new transmission lines. Then there are the costs of forcing grid operators to purchase excess solar power from customers when it is convenient for the customer and allowing the customer to demand power from the grid during peak demand creates negative externalities. These costs grow as more customers install roof-top solar. If PV were truly cost competitive, market penetrations should approach 100%, so it might make sense to assess negative externalities for this scenario. I suspect the negative externalities associated with roof-top solar will turn out to be much larger than those associated with fossil fuels. Market penetration won’t reach 100% even if it’s cost competitive. If that were the only criteria then rooftop solar hot water heaters would have reached 100% decades ago. franktoo: I suspect the negative externalities associated with roof-top solar will turn out to be much larger than those associated with fossil fuels. “Much” larger? Why, and what do you suspect them to be? Many details vary geographically: here in SoCal peak and trough demand are highly predictable, both as to timing and amount. Installations of roof-mounted solar should not cause any more problems than installations of high-consuming appliances like hot tubs and microwave ovens, which elicit no objection from the electric companies or grid managers. The most important externalities I can think of not already covered in other posts is that the other generating equipment will last longer and take longer to pay off the initial investment. I don’t see those as worse than mercury and coal ash. Matt asked why I suspect the negative externalities of electricity from renewable sources would be higher than the negative externalities from fossil fuels. I tried to do a calculation at one point. The standard figure of $30 a ton for the social cost of CO2 is relatively small when converted to kWh. I wasn’t satisfied with the results, but it led to the “suspicion” I reported. If interested, the authors of this post could do a better job than I.
I think there is value in discussion the issue with the same terminology as environmentalists: costs paid directly by the customer and negative externalities paid indirectly by the customer. Subsidies are negative externalities. State imposed requirements for percentage of renewable power is a negative externality. Requiring grid operators to purchase excess solar power at artificially high prices from solar rooftop owners is another negative externality. There are so many factors besides levelized cost of generation, that a systematic approach that fairly represents both most useful, IMO. If all costs are listed, individuals can substitute values that they feel are more appropriate. The authors of this post never use the phrase, the “social cost of carbon” and ruled out discussing “negative externalities”, because they are comfortable with a different accounting language and because some negative externalities do have great uncertainties. Except mathew, that wind and solar are not possible without fossil fuels, from the mining of the raw materials needed, the transportation to/from manufacturing plant, the manufacturing process, and final on-site assembly, and for wind, the need to clearcut forests in some locations plus the construction of roads needed to transport wind turbine components, and to provide backup power for when the wind does not blow and the sun does not shine. We need to find replacement energy sources that will ultimately have NO dependence on fossil fuels – not because of “globalclimatewarmingchange”, but because of the reality that fossil fuels are a finite resource. Investing in technologies that can be shown to actually use more energy than they generate is, well, I am not sure there is an adjective that can effectively convey the lunacy, so I will just stick with that, lunacy. franktoo: Matt asked why I suspect the negative externalities of electricity from renewable sources would be higher than the negative externalities from fossil fuels. My question was why “much” higher. Additionally, would you expect them to be reduced with continued R&D. Matt asked why Franktoo suspect the negative externalities of electricity from renewable sources would be higher than the negative externalities from fossil fuels. His question was why “much” higher. If I’m not sure about which negative externalities are greater, I can’t justify the phrase “much higher”. Matt asked: Would you expect negative externalities to be reduced with continued R&D? Which negative externalities? I suspect further R&D will reduce estimates of climate sensitivity, which could dramatically reduce the “social cost” of carbon. I suspect that policymaking and R&D on adaption will also reduce the social cost of carbon: crops better adapted to future climate, keeping development away from rising sea level in most places and better protected in high-value locations, etc. Mitigation was the only game in town until international negotiations floundered even after Obama replaced Bush, China because the largest emitter of CO2 (IIRC now twice the US, equal per capita to the EU, and rising), and other developing nations appeared likely to follow China’s footsteps. Not that adaption is no longer unthinkable, I suspect there is some “low-hanging fruit” that will make adaptation seem more practical. You expected me to say that further R&D will reduce the negative externalities associated with wind (subsidies, higher costs paid by less affluent neighbors who can’t afford roof-top solar). The renewables industry is addicted to government handouts and regulatory preferences. Between industry and environmentalists, policymakers probably won’t eliminate them away until we have reached our “goal” – 80% reduction in emissions. If solar and wind are going to move from the most effective locations – the Southwest and the windiest locations – to other parts of the country, subsidies will still be needed. In the case of wind, problems with bearings and optimistic estimates of realized capacity suggest that production won’t meet expectations. With panels becoming mature and now representing only half the cost, the days of large improvements from R&D could easily be over, leaving most of the country with costs well above fossil fuel generation. There is too much cynicism and pessimism in this reply. Consider it to be food for thought. btw my german electricity bill was 22% “Umlage” due to renewables. 24,8% was for grid costs. Thanks for well laid-out article with some concrete figures. Very useful. It’s true that the major gains in terms of PV itself have already been made. The money in solar is now in what you call BOS. Especially for residential installations a lot of the accessory electronics is still horribly expensive, though more competitive equipment is coming through. While the parity argument is point to examine, it is not the only argument to consider, despite some rather categorical claims in the article. Localised production and autonomy are important considerations, be it on a national or an individual level. Being free of a dependence upon on centralised generation and distribution of basic energy requirements is something I and many others consider worth investing in. I see that as becoming more important in the future. Another aspect of individual production is that once we go down that route we become much more concious of how much we consume unnecessarily. Reducing the massive levels of waste will have benefits for both individuals and national energy budgets. I was fascinated to learn that the Swiss buy up surplus electricity from Germany at an extremely low price on sunny summer days and use the power to pump water back into dams with hydroelectric plants. They sell hydroelectric power to the Germans at a much higher price on cloudy winter days with peak demand in Germany. Few people seem to discuss the Swiss system: Baseload demand provided by nuclear power; variable demand from hydro. No CO2 emissions. Reducing costs for your customers by exploiting your neighbor’s insane policies. Levelized cost of electricity is an inadequate method of representing the economics of such a system. Almost half of Sweden’s electricity is hydro. Most nations can’t pull that off. United States is less than 7%. Did you mean to write Switzerland? Though it wouldn’t surprise me to see the Swedes with 50% hydro. Neither Sweden nor Switzerland has nearly 100% hydro, but both have most of their power either from hydro or from nuclear plants. In Sweden hydro generation is usually the larger of the two, but last year they were about equal. In Switzerland nuclear is larger, when pumped hydro is excluded (on the net pumped hydro consumes power). In Norway practically all electricity is hydro. I made an error on Switzerland by misinterpreting the statistics. The share of pumped hydro is not nearly as large as I thought. Thus hydro is significantly larger than nuclear, but nuclear is important as well. (about 55% hydro and 39% nuclear in 2014). A British firm has developed a new type of sodium ion battery which they claim has aroused the interest of some large car manufacturers. Are they any sort of viable alternative to existing battery storage solution? Yeah, The energy capture and storage solutions to allow easy integration of renewables into the grid are about 10-20 years out. In 10-20 years these technologies should be able to compete on cost. It is a senseless and unproductive waste of resources and tax subsidies to deploy early and punish rate payers with higher energy costs. The renewable advocates haven’t come close to making the case, that spending a premium of 100s of billions of dollar for energy just to be fashionable makes sense on any level. The renewable advocates seem to think energy is a scarce resource that is expensive and must be conserved. This view is so at odds with reality that the usual mentally ill/misinformed explanations don’t really cover it. The renewable advocates need to be forced to disclose what their real agenda is, because it certainly isn’t the welfare of the average American. Yep. And it was 10-20 years out in 1980, 190, 2000 and 2010. It’s still 10 to 20 years out. Actually I say it will never happen. ERoEI precludes it. So it’s like nuclear energy which, starting in 1950, was going to make electricity so cheap we wouldn’t need to meter it? Sixty years later we’re still metering it and nuclear is about 50% more expensive than natural gas. David Springer, yes, Nuclear is cheaper than natural gas in the USA at the moment. But that’s just dodging the issue. If the requirement is to reduce GHG emissions (not my requirement) then nuclear is the least cost way to do it from electricity. If GHG emissions reductions is not a requirement, then fossil fuels are cheapest (gas at the momentum in the USA, coal in Australia. If the comparison is between nuclear and renewables, then nuclear is around 2 to 5 times cheaper than renewables at penetration rates around 50%. The gap increase as the penetration increases. You know all this so, as usual, you are just sh!t-stirring. 1. If we regulated renewables like we regulate nuclear power – we would be building the Starship Enterprise with energy from coal fueled power plants. Coal at about $ 53 per ton produces power.at about 6.2 ¢ per kwh. Renewables cost at least twice as much (I’ll accept any sane revisions to these numbers up to 10x for renewable cost). If we multiple the renewable cost by 8 with regulation to basically $1 per kwh almost any coal anywhere will be economically extractable and a better deal until there isn’t any coal on the planet. This is exactly what happened to nuclear – yet it is still close to cost competitive with other dispatchable technologies. 2. The renewable and nuclear technologies we are currently exploiting were reduced to practice 70 years ago (or more). We need to move to newer technology. Because of market forces solar cells have become vastly cheaper and more efficient. But the killer app is to use organic printable solar products for glazing or siding materials with cheap on site power storage. The current approach of covering up to 3% of the land area with power generation hardware is crazy. The nuclear industry is still using the ship developed power technology (PWR/BWR). We should move on to something inherently passive safe and more compact, that doesn’t have a dispersive failure mode. This makes much of the existing regulation unnecessary. Nuclear hasn’t gotten cheaper because we haven’t put the regulators on a lease. Given the US isn’t deploying new facilities there isn’t a lot of development dollars. The Chinese and Indians are going to get way ahead of us on nuclear power. Since there isn’t going to be a CAGW disaster we can repurpose climate change funds to compact nuclear and other useful research. That’s something that needs to be considered by people who claim to be long term thinkers. Tony we will look into it. Perhaps add a sentence to our complementarynto wind and solar grid storage draft in process. When the conventional submarines start using a new type of battery, that will be an indication of progress. The Japanese are moving to use the batteries that are in the Boeing 787 (and catch fire) in their new submarines (which Australia is considering buying). The US Navy and Darpa have spent more money on battery research than anyone. Rud, useful article, thanks. What I miss is a paragraph on the land area required for a significant contribution from PV to the electricity grid. Especially when people are talking about CO2 – free economy, with all energy coming from renewables. This is surely also an aspect of grid parity. For residential it goes on roofs so there’s no cost for land. If it’s grid-scale then it’s going into desert areas with few cloudy days. Desert land is so inexpensive its cost is not a consideration. Great site. Deluded but informative. While I have viewpoint issues with Mr. Jacobson, and this site is aimed at policy wonks and not the technically competent, it is a good effort. California according to this is going to chew up 2.61% of their land with renewables. terastienstra – the state by state land cost of a renewable energy US grid is addressed on the site – just click on a state, scroll down, and enjoy. I beg your pardon, I should have included Planning Engineer in my thanks for the article. > As with the true cost of wind we are not assigning ‘carbon externality’ costs to conventional generation, which are debatable. Neglecting something because it’s “debatable” implies one can neglect anything Mr. T will ever say. One might as well not assign any meaning to the authors’ complaint against (only some) subsidies because the concept of subsidy is “debatable”. Willard, you can plug in any carbon cost numbers you like to do your own analysis on top of ours. We don’t because we find them on balance indistinguishable from zero. The IMF’s are literally incredible. > The IMF’s are literally incredible. Your incredibilism  is duly noted. Speaking of plugging in carbon cost numbers (which was beside my point), having working links for the citations used by this post might be nice. Mr. T only swears by auditability. Agreed, Willard. I would have been nice to be able to directly follow up sources by a web link. Maybe an idea for the next post? In any case, thanks gentlemen for a very informative post! Your explanation didn’t help. Try speaking english not code phrases. > Your explanation didn’t help. This is debatable, Big Dave. Therefore, I won’t assign any importance to your request. Is that clearer, this time? IMHO solar PV is interesting when it coincides with peak demand. Places like the UK or Washington State for that matter where peak demand is actually in the Winter then solar PV must compete against fuel cost alone. The last I checked the cost of coal at Colstrip, Montana(where the big fossil fuel electricity generation for the Pacfic North West takes place) was about $20/ton which makes for a fuel cost less then 1 cent/KW. harrywr2, Montana must have a plan in place with the EPA by the end of 2016 to reduce its total GHG emissions 21% by 2030. Shutting down Colstrip would go a long way towards allowing Montana to achieve that target with minimal impacts on the great majority of Montana’s residents. Since CCS doesn’t work yet, either technically or economically, and probably can’t be made to work within the next decade, then more likely than not, the Colstrip power plants will be permanently closed at some point within the next ten to fifteen years. The price of electricity in the US Northwest will rise substantially as these closures take place. But along with California and Oregon, the voters of the region have made a firm decision to pursue the renewables, wind and solar, regardless of the predictable impacts on energy costs. This is only reasonable and appropriate given that it will be impossible to meet the region’s ambitious GHG reduction targets for 2025-2030 without a substantial increase in the regional price of fossil-fuel energy, increases which will encourage the energy conservation measures necessary to reach the targeted reduction goals. Shockley et al in 1961 is profound. Not much R&D expectation left if we are at 15 percent (low cost) and 20 percent high cost today! Already marching along at diminishing returns. It’s for a single P-N junction. Stacked junctions can exceed the limit. Most of all, any calculation of LCOE values should compare apples with apples, and therefore include, for intermittent sources like solar and wind, the additional costs of storage… otherwise any comparison to fossil-fuels/nuclear power stations will be impossible. Sure. Multijunctions with taylored bandgaps for different portions of the spectrum, made from III-V class semiconductors like Gallium Arsenide. Boeing makes triple junctions for deep space and military applications at something like 40% efficiency. Data was on the linked NREL chart, the purple types. Far too expensive for general commercial use. We had a paragraph on them in the initial draft; Judith suggested we simplify to the utility essence. We thought her suggestion was a good one for our purposes. This is a blog post about solar grid parity, not a comprehensive solar treatise. ristvan, thanks your comment is helpful. As noted in another comment, does this analysis include the cost of land required to produce a given amount of energy? In his book, “Power Hungry, the myths of green energy”, robert bryce cites energy density, power density, scale, and cost as the 4 pillars of electrical generation, and contends that the amount of land required for wind and solar make those alternatves non viable for industrial scale applications. What are your thoughts? didn’t address this directly but seemed to imply that high energy costs were a factor. On a recent visit to Cabo San Lucas it struck me that it might be a great place for combined desalinization and solar power facilities (severe water shortage and lots of sunlight almost every day) yet none are being built. I checked a couple of newer desal plants (Israel and Carlsbad Ca.) and from what I can tell they both purchase their electricity from the local power companies. The greenies fought against Carlsbad so maybe that precluded government subsidies for a solar installation. Kind of real world data saying solar doesn’t compete. I’m going to break up my comments into several questions. Subsidies: We could debate this issue “until the cows come home”, and I will not expend my energy arguing the pros/cons of doing so here at CE. The problem on this topic (as articulated time and again by even Conservatives in Congress like Senator Grassley) is having this discussion in a vacuum. This “debate” should include having all energy related subsidies on the table for debate (e.g., in Congress). This includes oil and gas (specific only to these industries), Normalized versus Flow-Through of Tax Benefits by IOUs for Ratemaking, Nuclear Catastrophic Insurance (Price/Anderson), Nuclear Tax Credits and Caps on Construction Costs (EPACT), Federal Loan Guarantees (including nuclear projects like Vogtle), mandated Ratepayer payment of nuclear construction (before units are placed in service). When Congress and Regulators put “Everything on the table — I’ll debate pros/cons here at CE. Thanks for another great posting about renewables and the grid. I have one question about grid parity that I have not seen addressed. Grid parity suggests that the renewable technology could be used instead of traditional fossil or nuclear technologies. However I think that over-simplifies one concern that can be summed up with this question: can renewable technology be used to power an electric arc furnace? For that application and many other manufacturing applications you need a dependable and large chunk of power and I don’t see renewables ever getting there unless fossil prices increase dramatically. Does your grid parity example of northern Chile mean you think they can power industry from a solar installation? Arc furnaces are the most challenging loads a I know of. It would be extremely costly, wasteful difficult for those to be powered by renewables unless it was stored in pumped hydro. I will add they can place a tremendous burden on the grid and the places where the grid can support the are limited as it is. So much for the “we can power the world with renewables” folks then. That also means that telling countries that don’t have adequate electricity now that they must use renewables limits what industry those countries can develop. It looks to me that the consensus is that renewables have a role in the future but have a ways to go before they can be considered the answer to everything. Base, Intermediate, Peaking Load: There is not a reputable electricity engineer here in the U.S. (that I know of) that makes an argument that current Renewables are ready to compete against Base Load generation options. So, why does the anti-Renewable Crowd keep on making this “Straw-man Argument”? In reading comments here at CE, many times I just end up shaking my head. Nevada is example, where many comments several weeks ago talked about a “conspiracy theory”, or “Big Government Overreach” with a “Green Obsession”, by Regulators to “mandate” use of solar in Nevada. How about that Nevada is simply following sound engineering economics? You simply don’t need every generation option to be available 24X7. The question is the capacity value of the generation option when you need it. This engineering principle is called “ELCC” or “Effective Load Carrying Capacity”. Using ELCC (which is used in Nevada) explains why solar projects can have an effective capacity value of ~80% (producing electricity when the integrated system needs it for peaking load). Peaking power means power generated to satisfy demand that’s not satisfied by base load generation or by generation that’s determined by non-controllable factors like sunshine or winds. It’s the most valuable form of power per unit of produced energy. Of the renewables only hydro (with reservoirs) is suitable for peaking generation (solar used to drive air-conditioning has a somewhat similar role, but not exactly the same). Thus it’s highly inappropriate to compare renewables to peaking units and much more justified to compare the cost of renewable generation to the cost of base load generation. As long as the share of wind power is small is small comparing its costs with the cost of base load units is not a bad idea, but with increasing share of wind the relative economics gets worse. Here is my question for you. You say that renewables are primarily for peaking load. Are you saying that renewables can be used instead of modern peaking turbines to replace old, inefficient, and high pollution rate peaking turbines that have to be replaced to meet lower pollution standards? In my opinion the need for new generation for high energy demand days in the northeast cannot be met with renewables because on the worst days (multi-day stagnating high pressure system) the wind resource is too low capacity. Solar on the other hand can help shave that peak. However, both solar and wind subsidies ultimately reduce the cost of power on other high demand days which makes the return on investment for the new replacement turbines lower. Is it not possible that the prices will get so low that the only way anyone will invest in new peaker turbines is if they get subsidies. rogercaiazza — I addressed your point by introducing the engineering concept of ELCC. Do some research on ELCC and then comment. In your research (the Dept. of Energy and its Labs like NREL have a ton of info on this) you will find that Utilities say in Nevada and even New York are applying a capacity value of ~80% on some of their solar projects. My specific worry about renewables is on high energy demand days in New York. Wind is nearly worthless but as you point out sun should be much better. Still when it comes down to replacing over a 1000 MW of old, dirty and inefficient peaking turbines in New York City I think that the solution is going to have to include fossil fuels. The State is throwing all kinds of money at renewables and distributed generation which, in my opinion, makes the business case for new combustion turbines a very tough sell in New York’s de-regulated market. You can’t arbitrarily decide which market renewables compete in. The marketplace should be setting the price for baseline, intermediate, and peaking power. When intermittency means your product (renewable electricity) is not always available at time of peak demand, producers of renewable energy shouldn’t be able to charge peak-demand prices. The cost of electricity for the intermediate market will vary the capital cost of meeting that demand – a fixed cost which has to be paid by grid customers whether or not unreliable renewables displace them. State laws mandating that a certain percentage of power come from renewables creates a totally separate “marketplace” where price isn’t a consideration until the supply of renewable electricity meets the state’s artificial demand. Have someone with some sense read frantoo’s comment and explain it to you Segrest. Have you taken any notice at all of the points made by Pekka? You are outclassed here. You are just wrestling with your own strawmen. SS comes up with this unbelievable, ridiculous argument that solar PV is primarily for peaking power when its availability is random and intermittent and wonders why people don’t like it when he accuses others of bad faith. Your best-case scenario for this would be someplace like L.A. or Phoenix, but even there it’s not going to be appropriate to rely on it–peaking power is the last thing thrown in when you’re trying to avoid a brownout so you have to be able to turn it on and off reliably. Solar PV doesn’t come close to that. Go the DOE website on LCOE. Why do different generation technologies have different capacity factors? Specifically, why does a conventional combustion turbine have a capacity factor of 30% assigned/associated with it? There are two totally different reasons for low capacity factor. For peaking generation like gas turbines the low capacity factor tells that variable costs are so high that the unit is used only, when the generated power is so valuable that the value exceeds the high cost. This is the case of peaking power. For solar and wind the low capacity factor is not due to concentration to the hours of maximal value of the generated power but due to variability in sunshine or wind. The value of the generated power is what it happens to be at that time, not necessarily higher than the average. It may be somewhat higher and it may be lower depending on the local conditions and properties of the power system. This case is not the case of peaking power. This is the case of intermittent power. With current technology, Renewables are primarily for peaking load. The justification for renewables is that they reduce emissions by replacing the high emissions intensity fossil fuel plants whenever they can. That means, RE needs to reduce coal burn as much as possible – i.e. whenever the intermittent RE is generating. They save some fuel (and emissions), that’s all. Intermittent RE has negligible capacity credit. It is not a reliable supplier of peak power. It has little capacity value as peak load plant. We still need the full capacity of reliable fossil fuels plants to meet peak demand plus reserve capacity margin. If RE is primarily for peak power, as Segrest wrongly asserts, then it can have negligible impact on reducing global GHG emissions, because peak power is a small proportion of total generation. Replacing peak energy with RE energy has negligible impact of reducing emissions – so Segrest’s assertion unwittingly acknowledges that RE can have little effect on global GHG emissions. Stephen – maybe this clarification will help. We speak in terms of peak, intermediate and base load generation in regards to serving “firm’ load. Some loads are also considered “interruptible” (or nonfarm) and in terms of generation they are not planned for as firm loads are. Just as in interruptible load is different from firm load, intermittent generation is different from base, intermediate, or peaking resources. (Although you can consider consider interruptible load as a peaking resource in some cases.) How you compare intermittent generation to “firm” generation (base load, intermediate and peaking) is probably more an art than a science. I don’t think you can insist on one approach as being right or wrong across the board. Note-as approaches change things are getting blurrier. Time of use rates blurs the difference between firm and non-firm load and also impact generation planning consideration’s. An alternative approach is to consider directly the state of the power system at the time of generation avoiding the steps of forming the load duration curve and determining the thresholds for peak, intermediate and base load from that. In this alternative approach, the decisive factor is the momentary marginal cost of generation and related to that the type of the unit on the margin. Solar and wind power generates always (as far as technically possible) with the full power available from the units under existing conditions. Wind power is usually almost uncorrelated with demand and availability of other types of generation. Therefore wind power occurs equally often under all system conditions. That makes if comparable to base load, which is similarly spread over all system conditions. As long as the amount of wind power is small, it is almost as likely to cancel load variations as to add to those. As long as that’s true wind power has a very similar value as base load generation. With increasing share of wind most of the variability starts to add to the need of load following power from other sources and the value of wind generated power goes down. Solar is both correlated with load variations and intermittent. A positive correlation with load adds to the value of solar generation while a negative correlation reduces it. In places like Southern California the correlation is positive, here in Finland it’s negative. The influence of intermittency varies also greatly and often in the same direction. Therefore the value of generation from the same solar panel varies hugely from place to place when the volume and the unit value change very strongly in the same direction. Solar power under best conditions correlates strongly, but not perfectly with the load. The main maximum in load comes typically later than the maximum in generation. This is what Tesla shows in its marketing material. Planning Engineer: The issue that I keep bringing up is that the issue of intermittency is highly dependent on the flexibility and integration of the grid that you are working on. The intermittency issue of Renewables would be of much greater concern say, in the South (with a high level of older PC units) versus say, in New England with their fleet of shinny new advanced combined cycle units and access to Canadian Hydro. Based on engineering economics that System Planners base our decisions on maybe the proper current amount of Renewables say in Mississippi is 1%. Maybe the proper penetration level of Renewables in New England is greater than 10%. No disagreement there. Stephen – off track – I did talk to some of our people about SAIDI. They confirmed as I’ve said that distribution SAIDI does not really tell you much about the reliability of the bulk grid. They reminded me that SAIDI numbers from different entities are not directly comparable. Besides differences in areas there are considerable differences in how/what/why/when different entities compile their SAID numbers so that comparing any two entities on reported SAID is not meaningful. You can Google Benchmarking SAIDI – to find out something about the extensive efforts utilities will go to so that they can compare such statistics. Here’s an example that happened not to long ago with the “transmission” SAIDI numbers. My companies numbers were significantly than our neighbors, then a terrible weather system came through and caused serious outages. In calculating SAIDI extreme weather events can be discarded. How do you define a severe weather event? By your outages. Our outage rate during the storm was just below the threshold we had established for exclusion as severe (it was a near miracle that the storms did not take out more of our system). Our neighbors outage rate was way above what was needed to exclude it, so they did. (No miracles and maybe worse tree trimming practices on their end). Our SAIDI included the storm, theirs did not. End result they finished the year with much better reported SAIDI numbers than we did even though we were better in every comparable period. A few more outages during the storm and our numbers would have appeared superior. Pekka Pirila The load shape, characteristics of the load shape, reserve margins, operating costs, and grid integrations are the Drivers in generation resource planning. The objective in System Planning is to find the lowest cost “right fit” for these Drivers. As almost every Electric Utility is demonstrating in the U.S., this “right fit” can be Renewables (especially solar for some peaking load). Does any application of solar always beat the cost of say a natural gas combustion turbine as the least-cost “right fit”? Of course not. Solar does contribute to the peak hours as I have stated repeatedly, but it’s not peaking power generation in the standard classification, because solar is not operated in load following mode. It cannot be operated in load following mode without energy storage, which is possible to a limited extent in CSP. Presently such storage has a negligible role. How much it contributes to peak hours and how much it reduces the need for real peaking generation depends very strongly on the local conditions. Planning Engineer — Its not SAIDI per se that I’m interested in. Its trying to find a “metric” that addresses the question of impact of high penetration levels on the Grid. You’ve brought up many of these concerns (which all planning engineers would have). Using Germany (as our laboratory experiment) to “test” these concerns, to date, I’m just not seeing any “smoking gun”. If not SAIDI then what metric should we use? Maybe a constructive theme is to explore “the engineering methods and their costs” that Germany has incurred to achieve high reliability with high Renewable penetration levels. Maybe the answer is that you can do almost anything (especially if you’re a smart German, which they are) if you throw enough resources and money at something. Maybe this is the way to approach this? Has Germany incurred incredible costs in integrating Renewables into their Grid? Pekka: Obviously you’re a very smart person. Where I’m balking on some of your comments is that (it appears) that you are always addressing Renewables on their “stand alone” impact/characteristics. In System Planning we consider not the “pieces part” but how the “entire integrated system” responds in the lowest cost and reliable way. Are you familiar with integrated System Planning models, say from GE? Also, on another point — what do you think of ELCC? My main technical competence since switching from physics to energy research is understanding energy systems, both in power generation and in other fields of energy. One problem in net discussion is that we are forced to simplify things and use concepts that are not exactly the same that we would use in doing actual planning or research. Concepts like base power or peaking generation are abstractions. Real power plants have only approximately the properties of these abstractions, and real planning is based on the real properties of each plant included in the analysis rather than on the properties of these abstractions. Solar power is particularly problematic, when abstractions are used to classify it, because it deviates very strongly even from those abstractions that are closest to it. Furthermore the properties of solar power and its role in the power system are highly dependent on the local conditions of the solar power plant and of the local power system. What I have tried to explain at some level is a range of typical situations. Some situations fall outside that, but I have presented enough flexibility to make my comments relevant to most. Hi Pekka — I’d like to ask you the same question that I’ve asked Planning Engineer. My question is not meant to be combative. Its a good-faith question. I honestly don’t know the answer. When we discuss potential problems of integrating high levels of Renewables into a Grid, where is the “Smoking Gun” in Germany (the World’s engineering laboratory of doing this)? What metric can we look to, should we be looking at? Peter -I may be understanding your question better and If Pekka has an answer, I’d love to hear that. I think your smoking gun wording points to a problem with what you are asking. A gun smokes AFTER it is fired. You are asking for a predictive test. Which gun is going to fire. No smoke till the trigger is pulled. If someone starts smoking their risk of lung cancer goes up. Both smokers and non smokers can get lung cancer or not. Maybe there is something new now, but at one time there was no test to say whether a particular smoker was at greater risk than a non smoker except the fact that he was a smoker (and possibly correlates of smoking). Likewise a lack of reactive synchronous sources puts a system at greater risk. Me looking at the system at a distance I can’t say any more about that systems risks than a routine checkup of a smoker can tell that he’s extra-beyond or less than the average risk associated with a typical smoker. I’ve given you links that NERC is trying to find such measures and metrics to identify risk, but have had no success in identifying such There is no reason to believe that all risks have metrics that will tell you if risky vp behaviors associated with that risk have been mitigated somehow or are enhanced in a particular case If some smoker tells me he is gargling with tea tree oil and therefore his cancer risk is lower than non smokers even though he smokes -I can prove he’s wrong, I just doubt he’s right. With a small sample and a low incidence of terrible consequences it’s hard to tell. There are several separate but interlinked issues that affect system integration of renewables. Some of them are purely technical but most have both technical and economic aspects. From the technical point of view wind power is much more problematic than solar power due to the rapid fluctuations One German transmission company describes here well what kind of problems they must solve in integrating wind power in their system. Under the German conditions solar power contributes nicely to the peak demand on daily basis as seen in the slides 65-75 of this presentation from Fraunhofer Institute. Solar power performs, however, terribly on seasonal basis producing almost nothing during the three months of highest demand and most during the months of lowest demand (slide 27). Wind has a better seasonal profile (the year 2014 was far better than average in that respect, but the average year has a higher winter time generation as well). Batteries and other forms of energy storage can solve the problems of short term variability, but only reservoir based hydro can really help with seasonal variability. A few countries in Europe (Norway, Switzerland, Austria) have enough reservoir based hydro for their domestic needs with some spare for export, but not nearly enough to cover the requirements of the rest of Europe. Pekka — Thanks, but my question remains. Yes, there are problems integrating high volumes of Renewables into a Grid — no argument here. But Renewable Advocates in Germany are quite adamant that despite these challenges, that Germany has built the or one the most reliable Grids in the World. They tout SAIDI (which is an albeit imperfect internationally accepted standard with data). Planning Engineer has and continues to discuss the problems in using SAIDI. My question has been “If not SAIDI, then what “Metric” is appropriate to measure reliability? Specifically, what “Reliability Metric” can we point to in the German Grid to illustrate the significant reliability problems with high penetration of Renewables. More and more, I’m personally concluding that there is no “Metric” that illustrates this point — Germany has built a very highly reliable Grid. But your above post continues to bring up what may be a constructive discussion theme. While Germany appears to have developed “Work Arounds” to a high penetration of Renewables in achieving and maintaining high Grid reliability — what has been the cost? Question: Do you know of studies that comprehensively quantify the costs (direct, but also indirect that you referenced) incurred in Germany to integrate Renewables into the Grid, that can “frame” this issue to us? Say, is it 1 penny per kW or a gazzilion dollars per kW? As long as there’s enough capacity online to allow responding to intermittency of wind and solar maintaining high reliability is primarily a question of cost. Very many articles discuss the question, whether the cost of German the Energiewende is too high. Unfortunately it’s difficult to figure out from these articles, what the case really is, because different papers present extremely different conclusions. The conclusions are very important for the renewable energy industry and research organizations that serve the industry. Both of these are major contributors to this discussion. They do miracles, when they explain, how small the costs to the consumers really are, while they must at the same time tell, how the subsidies must be kept high. There are equally questionable articles from the other side. These articles “prove” that the costs are really excessive and far too high, meaning too high by a big factor like 5. While I find this second group of articles also questionable, my own views are closer to their claims. I do think that the costs have been much higher than the value of the outcome even when all direct benefits have been taken into account and on top of that also the less direct benefits from advancing technology development are included. Unfortunately I cannot recommend any article that I know as a well balanced overview of the situation. Google search provides immediately a large number of articles from both sides, but little that can be considered impartial and balanced. Pekka — Thanks. If you see anything, please post it here at CE. Before tweeting they should read the post rather than Scientific American, which got it wrong. I am getting the impression you are not objective and impartial when it comes to providing balance on viable energy solutions to reduce global GHG emissions. I get the impression you are advocating for renewables and scared of nuclear. I get this impression because the few links and comments you post explaining nuclear objectively, contrasting with the frequent links and comments promoting renewables, unquestioningly swallowing their advocates’ spin, and the frequent links to anti-nukes articles and web sites. I have no idea what the solution to the energy problem, I figure it is none of the above, I’m betting on new technologies (may 4th generation nuclear). DId you find this article by Rud and PE to be pro solar? I certainly didn’t. The posts by PE, and by PE and Rud are excellent. I greatly appreciate you posting those. All in all I think you are doing an excellent job in influencing policy in the USA and the English speaking world, in many ways. However, many of the links you provide on nuclear are from really poor sources and many are simply nonsense. Likewise with many of the renewable energy links. Gen IV will take decades to become commercially viable and making a significant contribution to global electricity supply. Clearly Gen IV and small modular nuclear power plants are the way of the future (but they are a long way off). It’ll be a long delay if we wait for them. And why delay? The existing plants are demonstrably the safest way to generate electricity. So why not simply advocate for economically rational, ‘no regrets’ policies – e.g. advocate to remove the regulatory impediments that are causing nuclear to be far more expensive than it could and should be. I’ve written many comments on this. I don’t advocate for particular energy policies; rather I report on what others are saying (or provide a forum for Rud, PE, and stay tuned for a new post from Rutt Bridges). Judith, I understand. However, the issue is what and how you select what to include in “I report what others are saying”. I appreciate all you do, but hoping you can link to more balanced and authoritative and better informed source on nuclear and renewables in the future. PE and Rud’s posts are excellent. Thank you for posting them. I am sorry my comment came across as a criticism. My mistake on that. I would like it to be considered as a suggestion of how CE could improve its education of CE followers regarding how to reduce global GHG emissions economically. Mt response to PE this morning tries to clarify want I was trying to get at in my first reply to you. My apologies for any offence taken. I appreciate enormously what you are doing and what you have achieved already. One thing about nuclear plants, they need a small army of highly trained security personnel on 24/7/365 alert to protect them. Each man/woman costs about 2-3 times as much as your typical rent-a-cop. Add in generous overtime pay, fat pensions and military grade equipment, surveillance systems etc. and I can see why some utilities prefer other energy sources. That comment is spot on. It’s just one of many examples of the costs nuclear phobia has caused. It is completely unwarranted to jack up the cost of nuclear – the safest way to generate electricity – on the basis of safety. What would it cost solar if we required that they meet the same safety standards as nuclear, i.e. fatalities per TWh? Peter – I like that Judith provides a variety of links from differing perspectives. It’s good that she presents them for us to read and provides a place for us to discuss them. Sometimes I learn from differing viewpoints and sometimes the excellent comments I see from others make me see things were worse than I feared. I actually would like to find someplace with a regular feature collecting the worst stuff (what everybody is touting on Facebook) that is widely swallowed, so that it could be given a proper burial in the comments. I understand what Judith is doing and doing well. I am not sure if my point has been misunderstood or waht. My point is that, IMO, Judith IS doing a fantastic job of helping educate the world’s population to avoid economic catastrophe at the hand of the CAGW alarmists. However, she could do better if she posted links to less anti-nuke garbage, less RE garbage and more authoritative, objective balanced information on economically rational, viable energy solutions to reduce global GHG emissions from fossil fuels. We’ve had 50 years of the anti nuke scaremongering and over 30 years of the renewable energy advocacy. I don;t see that it helps to educate the world by continuing to push this nonsense. Renewables, such as wind solar, wave, tide, geothermal, supply about 3% of world electricity. They can’t do much. But nuclear could supply most of it – more safely and at much lower cost than renewables. Therefore, an appropriate balance might be to have more posts on nuclear than on renewables. That is not the case across the media or on CE. I suggest CE could lead on educating the followers on this just as it has on climate science, integrity of scientists, uncertainty monster, and much more. > I actually would like to find someplace with a regular feature collecting the worst stuff (what everybody is touting on Facebook) that is widely swallowed, so that it could be given a proper burial in the comments. There is such a place. It’s called Judy’s. which also neatly doubles up as my own attitude. Clearly not the way of the future. Storage of sunlight in hydrocarbon bonds is the way of the future just as it has been the way of the past for billions of years. The world’s infrastructure is already set up for it and there’s plenty of natural hydrocarbon reserves still available to bridge the gap between now and when genetic engineering produces synthetic organisms designed to do nothing but exploit photosynthesis for hydrocarbon fuel production. No one is delaying anything. It’s pie in the sky. Money goes where there is the highest chance of success. Meanwhile the crudest form of solar renewable (biomass) accounts for 5% of US energy consumption and 10% global. It’s the most accessible form of stored energy in existence. If all else fails people fall back wood to provide energy for heating and cooking. For billions of people it’s still their only means. Genetic engineering can and will solve the problem in a much cleaner, easier way than nuclear power ever will. Wildly false. Everything is safer. When nuclear power plants fail they fail huge and despite draconian safety standards there have still been a few failures. When other means of generating electricity fail they fail small. And nuclear cheerleaders want the safety standards relaxed in order to make nuclear more competitive. That’s a non-starter. No community wants a nuclear power plant for a neighbor. @curryja: DId you find this article by Rud and PE to be pro solar? I certainly didn’t. If you were hoping for 100% efficiency for photovoltaic then the article is clearly not pro solar, hammering hard on the Shockley limit of 31%. But as DS and others have pointed out, there are ways to improve on that limit. @DS: The world’s infrastructure is already set up for it and there’s plenty of natural hydrocarbon reserves still available to bridge the gap between now and when genetic engineering produces synthetic organisms designed to do nothing but exploit photosynthesis for hydrocarbon fuel production. says “In actuality, however, plants do not absorb all incoming sunlight (due to reflection, respiration requirements of photosynthesis and the need for optimal solar radiation levels) and do not convert all harvested energy into biomass, which results in an overall photosynthetic efficiency of 3 to 6% of total solar radiation”. So if efficiency is a factor in choosing between PV and photosynthesis, PV wins by up to an order of magnitude. PV isn’t self-replicating and self-repairing like photosynthetic organisms. You can’t create a salt-water pool and grow photo-voltaic microbes in it but you can do that with photosynthetic bacteria. Lots of sunny space that’s a complete waste of land otherwise so you make up in area the difference in efficiency. One other point, PV doesn’t produce energy in a stored form ready for consumption by the world’s installed base of hydrocarbon-burning machinery. What’s the efficiency drop down to if the electricity is used to create chemical bond energy? All these are side issue. The fact is, that is is not a viable way to provide the world’s energy needs, now and in the future. Nuclear is! You’ve repeatedly ducked those questions. It is a good point. Industry draws from the whole grid, so not a problem for moderate renewables penetration from a supply perspective. Of course, it still drives cost up. Germany ‘exempts’ industrial users from things like the Umlage for that reason. The Abengoa award in Chile was only 7% of what was bid out for additional generation. Does not unbalance the grid, plus the two power towers come with molten salt thermal storage for night time generation. I presume the rest of the Chile tender was fossil fuel fired. I know Ivanpah uses natural gas so they can pick up high load as soon as the sun comes out. Does molten salt add a lot of cost? Rud, I made the point in the third comment from the top of this page that Seattle and Phoenix are on the same grid. Your thesis only applies to residential generation and on-site consumption. A fatal flaw. Production in Phoenix and consumption in Seattle is happening today every time someone with net metering in Phoenix puts excess power back onto the western US grid. If an individual residence can make the numbers work then an industrial scale application can make it work even better through economy of scale. 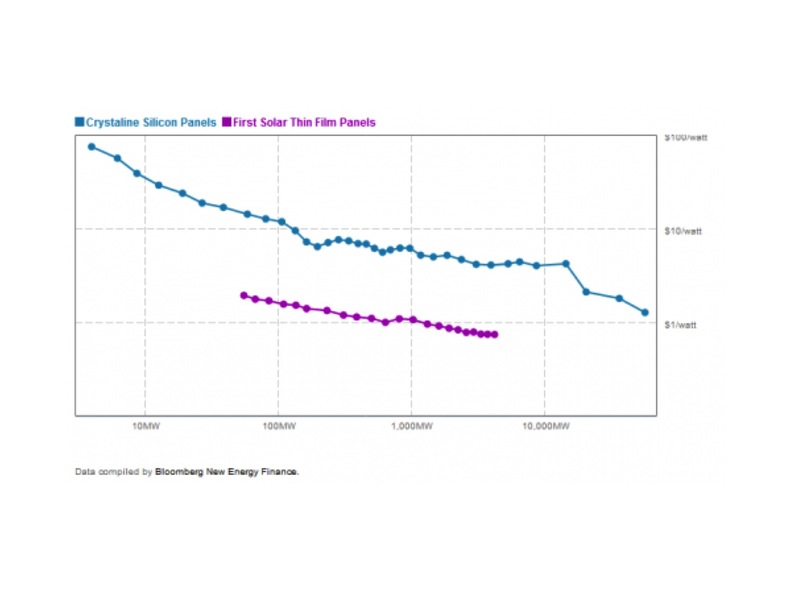 Connecting the eastern and western US grids, with four hours difference in peak solar production curve, can go a long way towards solving the local availability problem with sunlight. 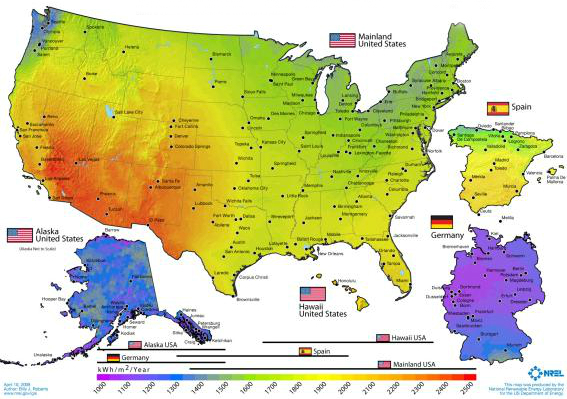 The east coast supplies solar energy to the grid while the west coast is still dark and vice versa. A global grid would solve the problem completely. The is always shining on half the globe at a time. Fuel Diversification: The background for this below post is Dr. Curry’s post on coal by Politico (e.g., Sierra Club’s success in blocking and retiring coal units here in the U.S.). In sworn testimony (time and again) by Electric Utility CEOs before Congress, the key point they make of why the U.S. needs Nuclear Power is the need for fuel diversification (hedging risk) — and not to become overly dependent on natural gas. If one agrees with this (which I do), then its important to be consistent and apply this hedging strategy not just to base load generation (nuclear) but also to peaking generation also. For fuel diversification arguments alone, this tells us that current technology Renewables have a rightful, justified by engineering economics, place in our generation mix (which will be different say in South Dakota versus Mississippi). In almost all cases wind and solar add to the need of real peaking power rather than reduce that. They have in a sense a negative peaking capacity. A gazillion engineers say at MIT, the U.S. Department of Energy and its Labs, Technology Organization like EPRI, disagree with you. As I wrote in my earlier comment and as many others have already written here solar power has an advantage when the peak load occurs regularly during the sunniest hours. Under those conditions solar energy is in part comparable in value with peaking power. In less sunny regions the situation is different. It’s particularly different in regions, where the peak load occurs in winter. Wind is never comparable to peaking power, it’s closer to base load, but worse than that. In regions with operational energy markets based on hourly (or semi-hourly) prices the value of limited amount of renewable generation can be determined best by using for all generated energy the price of the particular hour of generation. That’s a simple and straightforward method for finding the value of the generation. When the share of the renewable generation grows, it affects the hourly prices so much that the approach becomes less accurate. Even if there were a gazillion engineers in the world they would not disagree with Pekka Pirilä on this point. Typically, there is a daily peak (or peaks) in electric demand. If any generating capacity is online at that time, it will help satisfy the increased demand. But to be worth a premium price, the generating capacity must be available “on demand” and not variable/intermittant (else the entire grid will suffer). There are situations where individuals can generate power at “peak demand” prices. For example, most commercial US consumers of electricity pay a special “peak demand” charge that helps pay for the needed “peaker” units (that often sit idle until demand exceeds baseload generating capacity). These demand charges are calculated based upon their highest rate of use, often for only a few hours per year. The effective cost can be hundreds of dollars per kWh, spread over the monthly electric billings. For these consumers, “peak shaving” can be a cost effective strategy even when the technology employed (for example, rooftop solar) could not directly compete with the price of utility provided power. In those situations, the solar panels may, in fact, be providing power valued far above residential peak demand rates by avoiding excess demand charges. Stephen Segrest is correct. Pirila is wrong. The larger the grid the smaller the problem with intermittency. The sun is always shining somewhere. It doesn’t take a braniac at MIT to figure that out. On the surface this statement is more or less correct. 1. A mix of wind and solar will in general cover some chunk of peaking – perhaps 15-20%, but it isn’t going to be a consistent 15-20%. Covering 20% of the peaking load is not the same as covering 40% of the peaking load early in the evening and zero (0) percent later in the evening. This point seems lost on renewables advocates. The grid has to provide power 100% of the time.not just the 90% it can cover conveniently. 2. You can’t increase the regional size enough to resolve the solar peaking issues without massive transmission losses. The sun shines from a single point source with a relatively constant angle over massive regions called time-zones. 3. There is a lot of wind/solar output forecasting, power redistribution and balancing, and general power resource coordination in order to make the renewables look transparent. a. All the costs associated with this should accrue to the renewables. If other resources are used less efficiently, all customers need smart meters and demand throttling, or power transmission losses are higher, etc., that is a cost of renewables and the cost should not be shoved onto the other grid assets. b. All this grid balancing is interesting and there appears to be an opportunity to induce some interesting grid transients. There also appear to be some cascade failure modes. The answer may be that there are load resistors or other devices emplaced around the grid used to dissipate excess energy. Perhaps someone could cover how this is resolved and how much power is “burned” to reduce power spikes. Is overgeneration one strategy to deal with renewables with load elements burning the excess to smooth the voltage fluctuations? There is an extreme level of grid asset coordination here that would seem to create an opportunity for a stuxnet style disruption. .Hopefully there has been some attention paid to this and the communication links hardened. Wrong. Cost effective transmission lines can bridge distances up to 4300 miles (7000 kilometers). As the cost of generation declines rising transmission losses can be undertaken with no overall loss in system cost/performance. captdallas — You forgot to add that each Farmer should be given 1 gazzillion dollars, because we are wonderful people. nope, the farmers are going to have to buy equipment at retail and sell crops at wholesale. I get the big bucks because it was my idea, even though I know squat about farming. There isn’t anything wrong with up to an 18% blend of wind and solar in the energy mix. But renewables are going to cost pennies on the dollar a decade from now and be more efficient. Polluting prime real estate now with expensive and less efficient renewables doesn’t make a lot of sense. Covering more acreage with more expensive hardware is a fool’s errand. 10 years from now we aren’t going to tear up the less efficient renewables and turn the land back to other purposes. We are going to have wasted a surplus of land from the best sites on old less efficient expensive renewables and have to put new renewables on even more acreage. This is as bad as paying twice for the same power. PA – I agree with your point. But I am not sure how it applies to the big picture. The future design of anything will be more efficient and cheaper for anything, not just renewable. If I follow your logic, why would I build any energy system now – they will all be more efficient and cheaper in the future (presumably). How do you address that point? Postponing the investment is not necessarily a real alternative in market economy. If you don’t invest early enough, somebody else will. Thus optimizing the timing may mean losing the opportunity. Investments will be made as soon as they are profitable even if a later investment would be even more profitable. The claim that we need to install expensive inefficient nondispatchable power now is just silly and all the justifications are politically motivated. is silly. Just how stupid does something have to be before social progressives concede that installing a green technology is unwise? 1. Inefficient – they require more square miles – perhaps twice as much as 10 years from now. 2. Resource intensive: 100 tons of steel per megawatt (wind) and hundreds of pound of rare earths – PV with the mounting frames etc. is no improvement. 3. Expensive – perhaps 19-26 cents vs 6 cents for conventional. 4. Dirty (just because we are poisoning China instead of the US doesn’t mean the technology is clean). There is no win in deploying renewable technologies now, in most cases – they are losers. More efficient, low resource, cheaper renewable will not only make sense but win on cost alone. Why put up white elephants now? No it isn’t – right now gas and coal plants are as inexpensive as they are going to get and the fuel is as cheap as it is going to get. Might as well burn it while we have it. Renewables should be forced to compete unsubsidized. When they can win on cost alone they should be deployed. The claims that big this or big that will stop deployment of renewables are outright lies. The reason people oppose renewables is they don’t make any kind of economic or other sense in most cases. Technologies like organic printable solar are going to be unstoppable when they are developed. Using building exteriors for power generation makes a lot more sense than 1000s of square miles of fields of windmills and black glass. The precautionary principal demands that we lock all windmills now and ban new construction until the low frequency sound from windmills is proven to be safe. The greens demanded action over CO2 using the precautionary principal. Will they show integrity or be hypocrites about windmills? What you have said makes a great deal of sense to me. I am not sure that we will not improve coal plants, or even the efficiency of burning wood – but I am sure the improvements will be smaller and more incremental than improvements in say nuclear. Pretty clear that renewables are driving up the power cost in the US at a time of little or no change in power consumption. I demand as a consumer that either the most cost effective power assets be added – as was the case up to the mid 1995 when we got Gored by the global warming scare – or the greens surcharged for the unnecessary cost they are inflicting on the rest of us. As an alternative, honest Americans should be allowed a class action fraud suit against the greens to recover their excess power costs and some “pain and suffering” money for all the scaremongering stress the greens induced. Current U.S. Penetration Levels of Solar: To put things in “Real World” context, one needs to look at the facts here in the U.S. Per EIA, Solar’s generation mix is .004. The U.S. has a very long ways to go before solar penetration could possibly be creating “major problems” throughout the U.S.
Feel free to “Nudge” me on this when Solar becomes say, 5%. Stephen, the cost of solar is going to go down and the options are going to improve. Doesn’t make a lot of sense to build out much in that situation. Stephen – did you read the comment by rogerknights above where he provided a link to an article about Spain’s venture into Solar? “But the big issue for solar is simply scaling up the enterprise to capture enough of the sun’s rays to retire just a fraction of fossil fuels. Prieto calculates, for example, that to replace all electricity made by nuclear and fossil fuels in Spain would take a solar module complex covering 6,000 sq. km of the country at the cost the entire Spanish budget (1.2 billion Euros in 2007). It would also require the equivalent of 300 billion car batteries to store the energy for night-time use. What are your thoughts on Spain’s experience? Based on info like this along with info on Energiewende, it looks to me like solar and wind simply are not ready for prime time. If the information in this link is accurate, then wind turbine technology is not just net harmful, but egregiously so. Barnes: It’s impossible for me to comment on the Spanish project not knowing (A) the financial structure of the project; (B) an understanding of the associated utility load shape, generation mix, etc., and what the project was trying to accomplish. The key point is asking you a question: Does the project in Spain tell us anything relevant to all solar projects in New York?, or Nevada?, or California?, or Mississippi?, or . . . . ? This is the point in all my postings — you just can not make ubiquitous conclusions from one geographic area, its associated grid, penetration level, etc., and necessarily apply it in another. I will again say, I know of no reputable electricity engineer who believes that Renewables can currently displace base load en masse. Current technology for Renewables, by large, displaces peaking generation — and can make engineering economics sense (especially considering the penetration level). The subject of this post is whether solar has reached the break even point. Once it does, things should change rapidly in the regions with the best sunlight. This could create regional problems with power distribution even while penetration nationally is relatively low. Solar will reach grid parity first in areas, where peak demand coincides very well with maximal solar power. Under those conditions the problems with power distribution are likely to be minimal. Actually solar power is likely to reduce problems of distribution in under those conditions. Where problems are possible is in tariffs, which do not reflect properly the cost structure, but those problems should be solvable. franktoo — Your key sentence: This could create regional problems. Lots of things could happen — and Germany just isn’t cooperating with you, providing the “smoking gun” you want. Planning Engineer reported in an earlier post that by 2020 California will be generating more electricity from solar around midday than they can use given the other generating plants that must be online to meet demand during the rest of the day (especially late afternoon). Germany proves that solar can be installed where peak demand is in winter. Government subsidy makes parity irrelevant to behavior. captdallas — Remember, I just “hate” things like a Federal Renewable Energy Portfolio Standard (or even State locked in concrete percentages) — that put decision making in the hands of Politicians rather than our Engineers. Personally, I think in the “big picture” of things, everything is currently going OK here in the U.S. (e.g., State “targets” and not “mandates”) — lets see what happens over the next few years. That’s the way to go, we have Germany and California as guinea pigs. Within five years everything could change. Wagathon — What about the billions in dollars from the same DOE Loan Guarantee program for Nuclear (Vogtle Units 3&4)? Wagathon — Good for you — YEA! You are being consistent in your argument just like Ron Paul. While I personally disagree with Mr. Paul on Nuclear (e.g., Liability Insurance, Federal Construction Caps, Nuclear Tax Credits, Loan Guarantees, etc. ), I have “high” respect for him always “Walking the Talk”. As are you – but you are being consistently misleading with your disingenuous. You know full well that nuclear supplies around 30 times more electricity than solar. Therefore, the subsidies for solar energy are around 30 times higher than for nuclear energy supplied in the USA. You know that 0 you’ve been told many times before. Why do you insist on misrepresenting, misleading and avoiding the relevant facts? > I have “high” respect for him always “Walking the Talk”. Biomass alone supplies 10% of the energy used worldwide. Biomass energy is renewable and comes from the sun. Hydroelectric generation worldwide is 16%, and rising, of all electric power generation. This is also renewable and comes from the sun which evaporates water at lower altitudes where it precipitates into reservoirs at higher altitudes. Nuclear energy is worldwide is 11%, and falling, of all electrical power generation. Lang is SO wrong it’s simply ridiculous. Is it due to ignorance about traditional ways of using solar energy (biomass and hydroelectric) or dishonesty? And I’m not even counting indoor lighting through the use of windows letting in sunlight which would increase the effective use of solar power dramatically in and of itself. Willard — The context of my comments on Dr. Ron Paul is his positions on “energy”. I will suggest one additional US Federal research project: have the NIH fund a long-term look at the number of injuries and deaths associated with PV installations in the state of California. Require health-care providers to add a question about accident causation to admittance forms if not already in place. As millions of homeowners install, maintain, clean and generally fiddle with PV installations on their rooftops I would predict that these numbers will climb steadily over the next decade or so, and might far exceed deaths and disabilities due to coal mining, for instance. RIght!… lety’s talk about those loans. One should always normalize their amount with the electricity generated, and in doing that the nuclear red slice would become very thin, because of the 90% capacity factor… while the green one for solar would get very fat, with a 20-30% max CF. Robert and Segrest, how much do those loan guarantees to Vogtle cost the DOE/taxpayers? Do you know the difference between a gift, and a loan guarantee? Don’t you believe that those two nuclear reactors will actually produce electricity that Southern Co. will sell to about 500,000 customers? What are the chances they won’t pay back the loans? Are we talking another Solyndra? Use your heads. Helping out the elitist rich folks buying Teslas. Don Monfort: You’re “all knowing Crystal Ball” says nothing catastrophic can go wrong at Vogtle? Hope your right! Didn’t the French just experience something really bad in Finland? You failed to comprehend and you failed to use your head. Don’t worry about the French nukes. The gubmint owns it and the socialists are going to set it right, any day now. There’s another lesson in that for you, if you can muster up the ability to do some thinking. Don Monfort If there is zero construction and technology risk with Vogtle Units 3&4 that could place repaying debt in jeopardy, why did Georgia Power go after the DOE Loan Guarantee in the first place? Instead of being toxic to people all the time, you need to spend some time being a better “student” — especially studying what went on in the U.S. during the 1980’s with nuclear power. Electric Utilities such as Entergy went into default on nuclear power loans — where for about a year U.S. and Foreign Banks basically ran the company, including suspending the Common Stock dividend (where the Common Stock price tanked). Yes, bad things can happen. Stop being silly, Steven. How many strawmen can you pull out of your … in one day? Nobody said there was zero risk. The power companies borrow billions all the time. They are not risky greenie BS startups with no track record and pie in the sky plans. They took advantage of the DOE loan guarantee program to get a lower rate. Why not? Pretend you don’t know that. That’s the least the gubmint could do for the producers and consumers of nuclear generated electricity, since they put so many impediments in the way. Don Monfort — Remembering all the Electric Utility financial carnage in the 1980’s over nuclear power is not developing a Straw-man argument. I disagree with you that Georgia Power pushed hard to get a DOE Loan Guarantee “just to get some basis points reduction in a loan rate“. They did it to protect Georgia Power & The Southern Company of something catastrophic happening with construction and technology risk that could place them in severe financial jeopardy. Citing what has happened in Finland is certainly not a Straw-man example. Personally, I never thought that something like this could happen — especially from the French. It’s interesting that you want to focus on Solyndra and just shrug off the Finland story as an example of things that can go very bad at Vogtle. As to your’s and other’s rantings over President Obama — you have conveniently forgotten that he tried not once, but twice to get Congress to approve building ~13 new nuclear power projects (like Vogtle) using the DOE Loan Program. Stephen, the EPR thing could be interesting. The pressure vessel issue is 0.3 % carbon versus <0.22 % carbon in an area of the construction. The hook is "how could Areva install the component with such a glaring mistake." There is also the standard cracks in concrete and less than perfect welds. There could be some serious issues or it could be anti-nuke interference. China though has stepped up to defend their two reactors by buying into the French companies. That could end up being very interesting. Anyway, this highlights one of the hidden costs of nuclear, the specifications are so tight it is almost impossible to avoid so issues some where. . If this pdf is correct, the forge over-built the pressure vessel dome, ~330 mm thick versus 230 mm thick which should offset the carbon content issue. Welding foot thick steel is probably a bit challenging. Perhaps there are some nuke guys that can weigh in on this. They will cost A SMALL FRACTION of what the many solar (photovoltaic and thermal) units will cost. Just look at the numbers allotted for “renewable” energy and nuclear installations. That big corporations are greedy and try to get the most out of the taxpayers is a fact, of course, I’m not denying it, but saying, or implying that this is a feature of nucleare alone is a stretch of imagination, to say the least… or what comes out of the south end of a north-facing bull. roberttok66: Thus under your logic, base load generation is always much more important than peaking? Of course!… because baseload generates 24h/24, and therefore ALSO during peak-load times!… is it that difficult to understand? Both are essential for reliable supply of power. It doesn’t make sense to declare one as more important than the other. Peaking power plants like gas turbines are technically capable of producing either base load or peaking load (although the might need a lot of maintenance if operated continuously). Base load plants are often technically ill suited to load following. Another essential difference between peaking power units and base load units is in cost structure. The investment cost of base load plants is high but operating costs including fuel costs relatively low. That makes them economic when operated most of the time. Peaking plants have lower investment costs and higher fuel costs. That keeps the cost of maintaining sufficient capacity moderate, but makes it uneconomic to operate the plants for big fraction of time. Solar and wind power do not fir well in this classification. As I have described before, wind is closer to base power while the nature of solar varies greatly depending on the local conditions. Classifying solar as ether peaking or base load is equally wrong. The normal definitions of peaking and base load units require that both are available in almost all cases where the are needed (technical availability must be high, something like 0.9). The technical availability of solar and wind is a small fraction of that due to the variability of winds and sunshine. I seem to have missed an important fact. Nuclear produces lots of electricity. Solar doesn’t. My mistake. I addressed my reply to the wrong person. Sorry. Correction: You seem to have missed an important point. I recently have relocated back to my home in Tucson AZ and am pricing solar systems while they have a tax advantage. Does anyone suggest a solar installer in this area? This seems confusing to me. You are correct that my cost/kwh on Maui is 39 cents. But isn’t that cost increased beyond market forces by the circular fact that photovoltaic is heavily subsidized and encouraged and the electric company is required to accommodate it, which increases its costs, which are then passed on to the consumer in the form of a 39 cent/kwh charge, plus additional taxes to pay the subsidies? Thank you for this post. It is all very interesting and helpful. It is very difficult and complicated for me, as a layman, to sort through the public confusion and lack of readily available public information to assess and determine the true cost of “renewable” power. In comments to a recent gathering of business and political leaders in Paris, Saudi Arabia’s oil minister, Ali al-Naimi, suggested that his nation would phase out domestic consumption of fossil fuels by the middle of the century. “In Saudi Arabia, we recognize that eventually, one of these days, we are not going to need fossil fuels. I don’t know when, in 2040, 2050, or thereafter,” al-Naimi said. Because of this phase out, he continued, the Kingdom planned to become a “global power in solar and wind energy” that relied on renewable sources for its energy needs. Hasn’t Saudi Arabia also announced plans to build fifteen nuclear power plants? Why would they be doing that if they planned to be relying on the renewables for most of their energy needs? Don’t remember what Saudi’s have planned specifically wrt nuclear, but believe I remember UAE has made some announced plans wrt nuclear. Where Mid East producers highly subsidize domestic energy prices and use heavy oil or HFO for electricity generation as Saudis do, alternate generation frees up oil for export at a big revenue differential. Other countries – Iraq, Libya and Yemen – can rely on solar while developing domestic gas resources. Another group – including Algeria, Abu Dhabi, Iran, and Oman – can free up gas consumption for export. Qatar, which limits gas exports as a matter of policy, is a case apart and would not find solar economic in the immediate future. The Saudis, like the Norwegians, have shown real vision in this. The way forward is to sell lakes of fossil fuels while renouncing fossil fuels. Or just say you are going to renounce, without actually renouncing. The western mainstream press, as the Chinese have learned, can’t really tell the diff. Australia’s previous PM was renowned for her carbon tax and adenoidal condemnation “durrrrdy coal”. Didn’t stop her from presiding over our greatest mining boom, based on coal and coal-gobbling iron ore. There were even winks at a massive export drive for our brown coal. 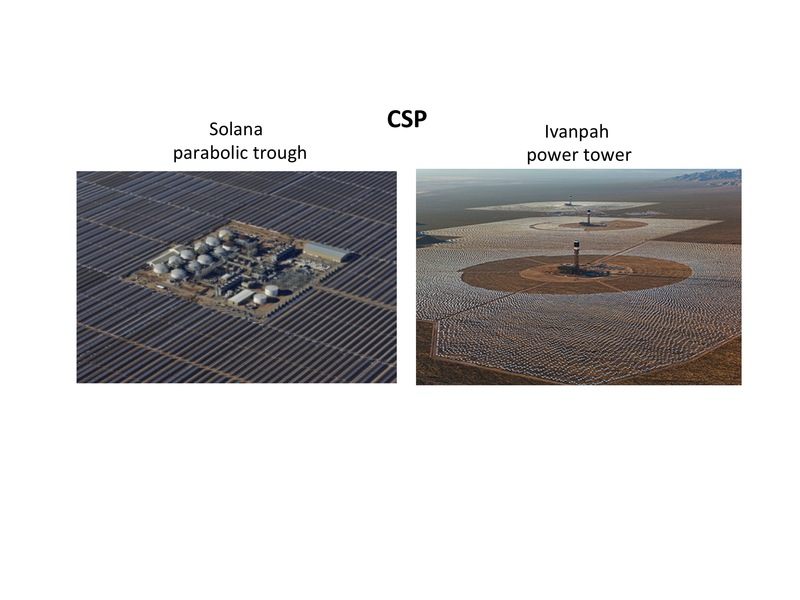 Ivanpah cost $19/W average http://www.ecc-conference.org/past-conferences/2012/BrightSource_ECC_Presentation_combined.pdf . That’s about 4 times the cost of nuclear. Plus much higher transmission and system costs than nuclear. Plus much higher fatalities per TWh delivered. Plus much greater environmental damage. No rational analysis would support the enormous waste of money on solar. Ivanpah cost how many lives ? Solar power causes about 10 times more fatalities per TWh than nuclear. You can’t pick out one power station. The comparison has to be done on an LCA basis. I don’t know how many fatalities were attributable to Ivanpah so far or will be through it’s life and final disposal. Do you? Did you check before asking? or is it a rhetorical questions? Oh so when you said “Ivanpah cost $19/W average…Plus…..Plus…. Plus much higher fatalities…” , you were talking about people falling off roofs while installing solar PV. Sorry, I lost the thread of your logic. I did search and could not find any mention of deaths at Ivanpah, so wondered what you meant. So if you consider we need to do LCA and these plants are only just going into service, your “Plus much higher fatalities per TWh delivered.” was fiction. That tells me how much notice I should be taking of your other comments. Thanks. What was the build cost of the first generation of nuclear reactors? You can look all that up for yourself. But it irrelevant because solar thermal engines have been in development much longer than nuclear and are still around four times more expensive. According to EIA numbers, the first nukes came in costing less than a coal plant. Then over-regulation drove the price through the roof, as it is now doing for coal. Saudi Arabia has upped the anti on solar “grid parity”! ACWA Power-led consortium has been selected as the preferred bidder to build the first expansion phase of Dubai’s solar park which has been doubled in capacity to 200MW. . . .
Reports suggested that ACWA had also offered to build the entire 1,000MW at a lower price of $5.4 per kWh. And today it was revealed that the winning bid for developing the upsized 200MW was $5.85 cents per kWh. Solar thermal in the USA at $19/W average About 4 times the cost of nuclear! A presentation on the Ivanpah CSP project in the USA, currently under construction. Nameplate capacity is 370 MW peak electric. 1,000,000 MWh/year. This means an average power production is 114 MW electric. Capacity factor is 0.31 or 31%. the project comes in at more than $19/Watt average electricity delivered. This is 3x the cost of some recent nuclear powerplant builds that most environmentalists have accused of being prohibitively expensive. The heliostats used in the project weigh in at 30,000 tonnes. That’s 262 tons of heliostats per MW electric average. That’s just for the heliostats, not even the foundations, not to mention the tower and power block. The powerplant area that had to be bulldozed over is much larger than a nuclear reactor 20x the average (real) capacity (twin unit AP1000). PL, that is what they projected. Actual Ivanpah CF is 19% to date. They now claim that in four years they can get back to their original projections. Thanks Rudd. I’d seen that. I understand a significant part of the reason for the much lower than expected CF was they hadn’t allowed for the effect of chemtrails (from aircraft). I wonder how they are going to fix that? Perhaps they can divert planes away from their power station. Or perhaps we can replace fossil fuels planes with solar powered planes. Does your costing of nuclear include decommissioning costs, waste recycling and storage and accident insurance or are you only counting building cost? Just wondering since you seem have a rather partisan attitude. .
It’s also not realistic compare the one-off cost these first generation industrial scale CSP systems with mature nuclear industry. Ten years ago PV was about four times what it costs today. Rudd’s article took a broad view and took many factors into account. Perhaps you could adopt a similar style. Does your costing of nuclear include decommissioning costs, waste recycling and storage and accident insurance or are you only counting building cost? If you don’t know that, it suggests you haven’t done much objective research on the subject. BTW, decommissioning of nuclear plants is about 1/3 the cost of decommissioning renewable plants – when compared on a properly comparable basis, i.e cost per MWh of electricity supplied through life. Since everyone has their own version of “levelised” or “properly comparable basis” it’s hard to know what to make of anything we find. That is why Rudd’s article was appreciated. Having decided that I am insufficiently informed, you still failed to answer the question, which I suppose let’s us guess what the answer is. The full LCOE includes decommissioning costs, waste recycling and storage and accident insurance . However, some analyses (such as Australia’s exclude them. The reason they exclude is because they are trivial and cause endless arguments about the trivia. It’s pretty hard to make any sense of that report since the guy who wrote it knows nothing about what he’s writing ( except for getting capitalisation of the units correct, which is a bonus ). Build costs would normally be in USD/watt or similar; energy costs in cents/watt . It is hard to tell whether ” $5.85 cents” is six dollars or six cents! Build costs are given “per kWh” , so is it build cost or the cost of the energy supply once built? If it is build cost, what is the energy cost from these CSP systems? In short, it tells us that there’s some big money deals going in Arab states but is so badly written it does not inform us about the costs. mae culpa copied in a hurry w/o thinking. Saudi purchased cell manufacturer and providing financing. DEWA had called on solar project developers to submit their bids for a fixed tariff over a 25-year period under a Build-Own-Operate (BOO) model. This was a much-awaited opportunity for local players who were missing out on solar action due to delays in the mega Saudi plans to deploy solar power. Of the 24 solar developers who started, only 10 remained till the final round of the bidding. Riyadh-based Acwa Power (owned by eight Saudi conglomerates) bid a record low tariff of just 5.98 cents/kWh. To get an idea about how aggressive this is, consider that the average of the 10 finalists’ bids was 9.35 cents/kWh, with the highest bidder being the Chinese Huaneng Power International at 14.71 cents/kWh. . . .
First Solar’s name pops out at two places. Not only is First Solar one of the project bidders, but it also seems that Acwa Power will be using First Solar’s panels. That should be something to cheer the company up. Renewables International makes an intriguing comparison between solar electricity prices in Germany (~10.85 cents/kWh) and in Dubai. As per NREL data, the insolation in Dubai is a little more than twice that in Berlin. So, on the basis of German prices, the prices in Dubai would be around 5.4 cents/kWh.. . .
Dr. Borgmann also informs that low-cost financing has been a key ingredient to keep the tariffs low. In the politically stable environment of Dubai, project developers have been rumoured to secure loans at a margin of 175 bps over LIBOR, on a floating rate basis. Assuming 300 bps for the hedge to fix the interest rate, this would probably mean a 5% fixed-rate cost of debt, give or take. First, I think you should have gone the extra mile and included a range of estimates for the external costs of fossil fuel generation, especially coal. Although some green activists go way overboard in attributing every societal ill to fossil fuels, that shouldn’t obscure the fact that there are real, quantifiable negative externalities associated with getting electricity from coal. Second, your geographic description would be more valuable if you overlaid population as well as insolation. Grid parity as I always saw it defined referred to a level of population having access to solar at the same price as other forms of generation, not so much geographic range. Finally, given the percentage inverters take of BOS costs, I think exploring the potential for innovation in inverters to ratchet costs down would not be amiss. Otherwise, thanks for a very interesting post. 2. Yes, but this is a blog, not a textbook. And except in SW US, people do not have the wealth to indulge in this stuff. Somalia? India? 3. Inverters are about 96% efficient. They can come down in cost as power semiconductors switch to SiC, higher switching frequencies, smaller magnetics. But are already only about $10/kW in volume production. Lots of solar companies say that costs could drop dramatically with standardized application and permitting. I don’t think innovation is finished in residential solar. I agree with thomas. Silicon pricing won’t go much lower but there is still a lot of slack in the accessories pricing. ” $10/kW in volume production.” Retail is about 10 times that PV regulators for battery charging are 30 or 40 times that cost. Now subsidies are being phased out suppliers are going to have to get real about the pricing. Previous french president, Sarkosy, put a stop to the over-generous feed-in tarifs that were leading to massive number of planning applications for small scale PV and would have added several billion euros to the nations annual energy costs. There is still a preferential FIT but it has stopped the glut of 20 year contracts at 5x the usual consumer tarif. To do a full cost/benefit analysis including externalities, you would need to come up with a list of positive and negative externalities for all energy sources, and factor in all subsidies and the various other tax treatments. Your comment on the negative externalities of coal implies that you think there are no, or negligible, negative externalities for renewables compared to coal. As you noted, greens grossly exaggerate the negative externalities of fossil fuels in general, and coal especially, while totally ignoring the benefits, and also ignoring that the “green” solutions they advocate for could not be built and maintained without fossil fuels, and, they can not reliably provide sufficient energy to power our growing electrical requirements – other sources of energy – most often fossil fuels – are needed to back up wind and solar. I just want to thank the authors, and, of course, JC for this fine series of data. As an engineer, I have long been frustrated with the difficulty of getting facts in this area, and these posts do a lot to help in that regard. There are two types of “parity”. 1. Parity with costs of CCGT or coal production. Solar is very far from this, it costs 2 or 3 times more. Will probably never happen. 2. Second “parity” is parity for self generation and use. PV owners can use their own solar electricity during the hours when it is available, and thereby save the **retail** price of the utility and reduce their bills. This is parity to retail price and is easier. When this kind of parity is reached nobody can stop people from installing solar systems, because it’s independent from any interference by regulators. This point has not yet been reached, but it might be reached in the future. Jacobress, the utilities and regulators are already preparing to charge solar PV owners to use the grid. That is fair, because they are not paying their fair share. The cost of power generation is whatever you are prepared to forego in lieu. Opportunity cost and all that. The Sun is free. Oil is free. Coal is free. The maintenance will get you. I know people who are off grid, in some cases where grid power is available, for a cost. What is your income? What are you prepared to forego? What is your personal preference? Do you prefer to amble on foot, enjoying Nature, or travel by Tesla, or perhaps Maserati? I use the grid. I don’t have to, but I like the built in capacity to use air-conditioning, an electric welder or electric oven, stove, kettle or griller. Others don’t. If the situation changes, so wilI I, I guess. I hope for something like personal fusion – hot, cold, I don’t care, as long as it’s more cost effective than what I’ve got. Greedy, I know, but that’s how it is. Solar grid parity? Not so far, but who knows? Certainly not me! The table below lists the central estimate of projected LCOE (wholesale price) in in Australia in 2050 with nuclear not permitted and with nuclear permitted; the third column shows the ratio ‘No/Yes’ (i.e. nuclear not permitted / permitted)’. Cost items of common interest are itemised. Costs are in $/MWh. Item	No nuclear	With Nuclear	No/Yes	Ref. Policy analysts also need to include an estimate of the risk that renewables will not be able to deliver the benefits claimed by their proponents. We know nuclear can provide around 75% of electricity in an advanced industrial economy because France has been doing it for over 30 years. But renewables have not demonstrated they can or will be able to. Many practitioners think they will not. An estimate, in LCOE equivalent terms, of the risk that renewable technologies do not meet the hopes of the proponents is $54/MWh. Therefore, the LCOE of the ‘no nuclear’ option is 2 x higher than the ‘with nuclear’ option. And emissions would be 3.2 times higher. The risk that renewables will not be able to do the job is the major risk that those concerned about GHG emissions should be most concerned about, not the costs of nuclear waste disposal, decommissioning, accident insurance etc. all of which are negligible compared with the LCOE and the risk that renewables do not deliver the benefits claimed by their proponents. 6. Peter Lang, 2013, ‘Renewables or nuclear electricity for Australia – the costs’, Figure 7. Estimate the risk renewable energy technologies, that meet requirements, will not be available by 2050 to provide 50% of electricity economically. Nuclear – already proven it can do it (France for past 30 years), so say 5% probability it cannot in 2050. Renewables – not demonstrated they can do the job, EROI suggests it cannot do the job, many practitioners say it cannot; therefore, assume 90% probability it cannot. Consequence = Social Cost of Carbon of the emissions not avoided by the technologies. Assume the projected carbon price is equivalent to SCC. Weighted average carbon price (from Australian Treasury 2013 projections) is $60/tonne. Average projected Australian emissions intensity (for delivered electricity) is about $1t/MWh. Therefore, average carbon cost would be about $60/MWh. A Planning Engineer, I’d like to have a conversation with you offline about a bunch of details. If you’re interested, please say so and I’ll post an e-mail address. Or you can message me on Facebook. We could do it here, but I find thus format to be poorly adapted for a detailed 1-on-1. I will abide by any terms you want to set, as long as they’re not crazy. I sent you a note yesterday. My only term is you let me walk away peacefully when it gets too detailed. Worldwide nuclear electrical generation is 11% of total and falling. Worldwide hydroelectric generation is 16% and rising. Hydroelectric is carbon emission free, solar powered, infinitely renewable, and available upon demand. Personally I don’t see any benefit in being carbon emission free. I see a huge benefit in that hydroelectric failures can’t possibly result in massive radioactive pollution nor provide materials for weapons of mass destruction. Why is it that I lived through a thunder storm that caused a dam to break and kill 100s of people and I never lived through a nuclear accident that killed anybody? Just to remind nuclear power opponents, Fukushima caused 3 workers to get a below 25 REM dose, which increases cancer risk by roughly 0.1% to 22.1% from 22% over 70 years. The tidal wave and earthquake killed roughly 20,000 in Japan. The tidal wave from Indonesia killed 240,000 world wide. Energy to provide electricity for light, cooking water and sewage treatment will save lives in the poverty stricken parts of the world. We need to lead the way to rationale discussions to put this in perspective. Rich areas like California can afford the high price for environmental solutions that move the state of the art towards economic efficiency but the big impacts come from grid expansion in the 3rd world. Yes you have lived through several nuclear accidents. You’ve also lived through uranium mining accidents that killed people, you’ve lived through nuclear bombs that killed hundreds of thousands, untold number of workers killed in mining and construction of nuclear power plant components, etc. There’s no such thing as a free lunch. Now the wind and solar numbers have to be divided by about 5 to get the effective contribution. 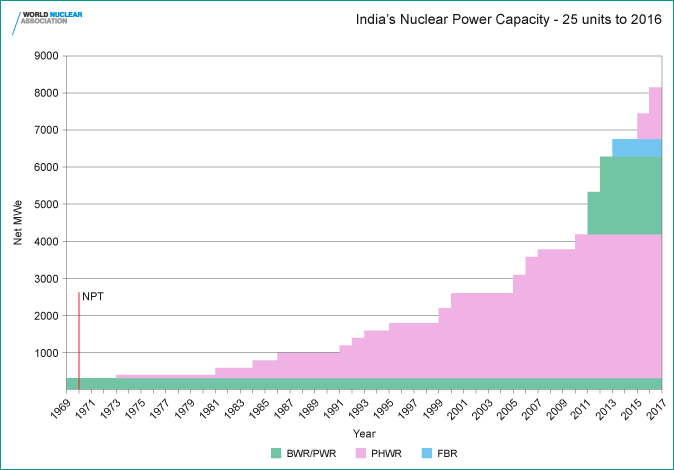 It is pretty clear that decline in nuclear was a short term impact of Fukushima – and that nuclear will not be declining in the future, given the plans of Russia, India, and China. China has proposed for new power generation about 1/2 of the current total global nuclear power capacity. The claim that nuclear power is going to decline is simply wrong. The claim is factually incorrect. The claim ignores reality. The claim is unsupported by the data. However what is true is the west is going to left in the dirt with expensive unreliable land-gobbling renewable power while other nations go nuclear. We must be looking at different graphs. Nuclear power plant construction went flat in 1986 with the Chernobyl meltdown not the 2013 Fukushima meltdown. How can I take you seriously after you made such a false claim demonstrated by your own first graph? Rud etal, thanks for the interesting post! I live in the Netherlands and bought 12 panels (2760 WP) in 2011 for 7100 euro’s, everything included. So my panels cost me € 2.57/W (US $2.85/W) In 2014 this had come down to €1.60 and this year it’s €1.45 (US $ 1.60/W), again: installation, inverter, wiring etc included. Is the US incredibly more expensive when PV is concerned? That’s exactly my problem too. If you start out with such high prices, surely grid parity is nowhere in sight. But in reality, prices are much, much lower… Or are we talking about different things? California prices are usually different than the real world and may not be that useful as an example. $17,500 appears to be the magic number. The cost is about $3.48/WDC before about 40% is paid by other tax payers. A non-tracking roof installation is at best 70% efficient so rooftop solar still costs more than $5000/kW installed. Vincent, fair question. The statement was based on the residential rooftop PV system average actual installed cost in Palo Alto in 2014. We linked to their presentation; the data is on page 27. We had made the assumption that was a representative price, since the point of the presentation was to persuade people that with the state and federal subsidies, plus the $800/kW that Palo Alto itself provides, rooftop PV was at ‘grid parity’ and everyone should deploy it. The city even has a PV office to facilitate installations for residents. A big problem we have here at CE are the absolutism paradigms that people create. Such as 100% Renewables (or extremely high penetration levels) versus Zero Fossil or Nuclear Fuels. Some of these paradigms are quite amusing. Such as the logic of (A) Criticizing Mitigation Advocates for their catastrophic messaging (CAGW); (B) But then these same people arguing that the only way to meaningfully reduce CO2 emissions to avoid CAGW is through nuclear power. While most of the more vocal folks come to CE just to fight the ABB slide coupled with a mitigation strategy of Fast Mitigation (reducing smog, CFCs, Black Carbon, Methane) represents some “no regrets” approaches to AGW. Stephen that has been on my list for years. If you want more solar for example you start with energy efficiency first to reduce local energy storage needs and move from there. Just sticking grid connected solar on system not designed for intermittent complicates the process. It also tends to limit “private” options by increasing connection costs to more than usage costs. As far as reducing smog, CFC’s BC etc., the US and most developed nations are close to limited returns. There are improvements that can be made, but the warm and fuzzies are jumping on PM2.5 and PM1.0 band wagons along with Mercury etc.more in order to kill coal than improve quality of life. That will lead to less coal research making the developing nations dirtier in the long run. Governments should set goals and get out of the way. The warm and fuzzies have grown fond of the iron fist though when they need to be passing out more carrots. 1. I believe in the “basic science” of AGW. However, I believe that its a “Wicked Problem”, and we don’t know “how much” and “how fast”. 2. I “dislike” Top/Down policy options of a Carbon Tax, Cap & Trade Schemes, or a Federal Renewable Energy Portfolio Standard. 3. All Renewable Energy decisions should be made by our Engineers (not Politicians), following engineering economics. 4. State Renewable Energy Programs are just fine, IF they are in practice viewed as “targets” and not “mandates”. It is totally appropriate for States to “nudge” their electric utilities to keep abreast/adopt new engineering methods on how to evaluate Renewables (e.g., Effective Load Carrying Capacity, ELCC). 4. I don’t believe in “Mass Conspiracy Theories”. When an Electric Utility like Georgia Power announces a solar program (they say, to meet peaking load), I believe they followed sound engineering economics in making this decision — and were not “forced” by their PSC to do so. 5. I like Tax Credits to spur innovation. But tax credits shouldn’t be viewed as “forever”. The ethanol tax credit’s time had come, maybe the wind energy credit’s time has come. As long as solar’s costs are doing what they are doing, I’d say continue them. 6. Generally, I oppose DOE Loan Guarantees. The one exception to this is Nuclear. We just need some “success stories”, and I support Vogtle and Obama’s efforts (two times) to build ~13 new nuclear power plants. I also support the Energy Policy Act which capped nuclear construction cost over-runs to Utilities and gave them a tax credit (very similar to the wind energy tax credit). I support continuing nuclear liability insurance (Price-Anderson). 7. I do not believe the EPA “over-reached” on the Mercury Rule. On Smog, when the EU (60 ppb) and Canada (63 ppb) implement Regs citing scientific health reasons, this means something to me. 8. I believe international AGW treaties are a waste of time. I believe that figuring out how to achieve win/wins through international trade agreements is much more effective and pragmatic (as Jon Huntsman was arguing). 9. Forget AGW, the U.S. needs both Nuclear and Renewables to have adequate fuel diversification in base, intermediate, and peaking load generation resources. Recognizing what’s going on with coal, we can not become overly dependent on natural gas. (Note: Very few people will read this. I really writing to “bookmark” my comment and link to it when people say I am a and Ideologue and a “bad faith” person). the second #4…. When an Electric Utility like Georgia Power announces a solar program (they say, to meet peaking load), I believe they followed sound engineering economics in making this decision — and were not “forced” by their PSC to do so. State PSCs have “forced” utilities to take non-economic actions for as long as their have been PSCs. Consider nickel phone booths and lifeline phone services. Regulated utilities must answer to regulations which serve sociopolitical purposes, remain sensitive to the threat of future regulations and understand that one or two unhappy PSC members can make the next rate-increase hearing very difficult. Ultimately the success of a regulated utility depends on social and political skills as much as sound engineering. Not quite a “mass conspiracy theory” when you get down to it. The difference is adding renewable energy now, given current hardware, doesn’t generally serve a positive sociopolitical purpose. I read it and support your positions on most of these. I am also an engineer and worry about externalities of coal to clean water, NOx and SOx, mercury, strip mines and deep mine drainage, slag ponds and lots of other things. CA is running an experiment with high electrical costs and working on solar and wind. Georgia is trying nuclear and coal. Texas has oil, gas and lots of wind. This is a rich country and we can afford to experiment. Maybe our system can drive down costs of solar to make it useable to remote locations in the sun belt. I also support energy to poverty stricken 3rd world places for lights, heating and cooking. Plus new clean water and sewage systems. Too many other priorities there for them to concern themselves with CO2. Just wanted to say that your are not alone on this blog. In your Conlusions you write about the few places on earth where grid parity is now possible or a fact. And you state: ‘The Saudi Arabian peninsula would be a candidate but for its abundant inexpensive natural gas and CCGT’. Did you miss the news in december last year that Dubai has tendered a 100 MW solar power plant which will bring it power for 5,98 ct/W, no subsidies involved. Pingback: Weekly Climate and Energy News Roundup #182 | Watts Up With That?